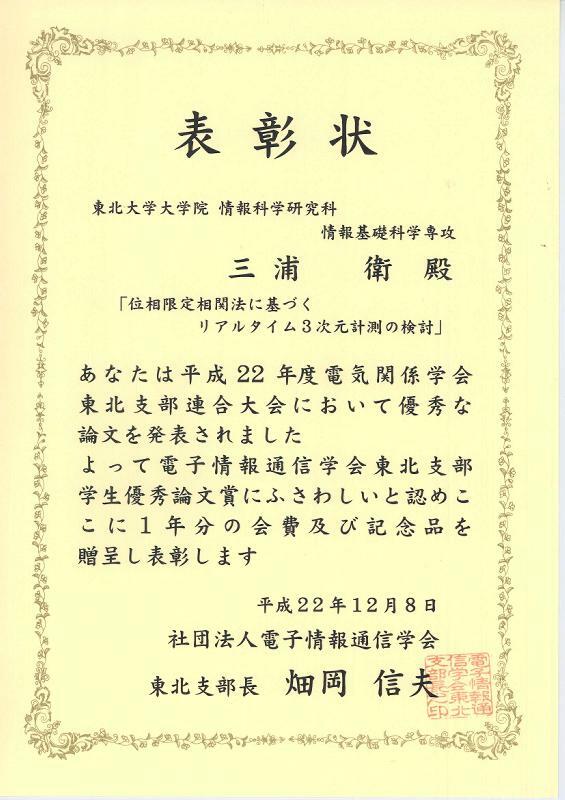 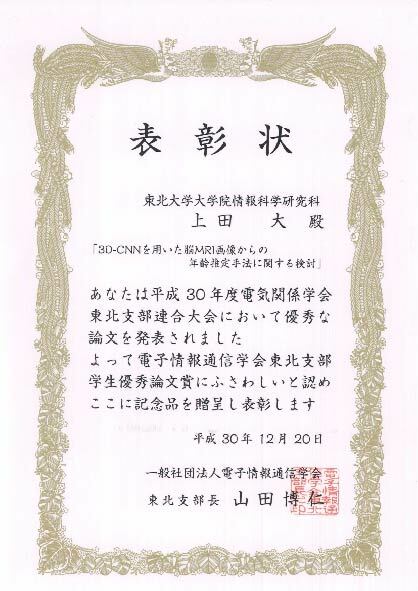 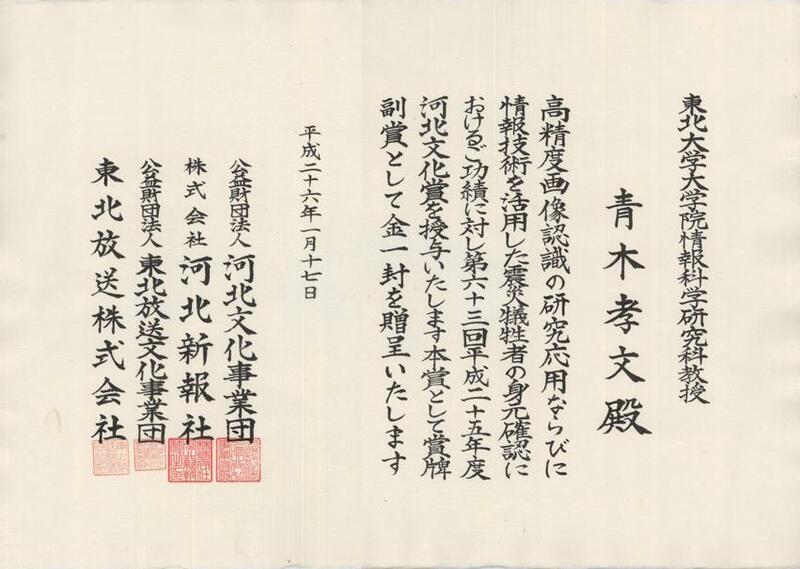 映像情報メディア学会 丹羽高柳賞論文賞  三浦衛，酒井修二，石井純平，山尾創輔，伊藤康一，青木孝文： カメラの移動撮影に基づく2視点からの3次元形状計測とその性能評価 "賞状" "副賞"
2014年暗号と情報セキュリティシンポジウム SCIS2014 イノベーション論文賞  林優一，本間尚文，三浦衛，青木孝文，曽根秀昭： タブレット端末に対する電磁波を介した情報漏えいの脅威 "賞状"
The Workshop on Cryptographic Hardware and Embedded Systems (CHES) 2014, Best Paper Award  N. Homma, Y. Hayashi, N. Miura, D. Fujimoto, D. Tanaka, M. Nagata and T. Aoki, "EM Attack Is Non-Invasive? 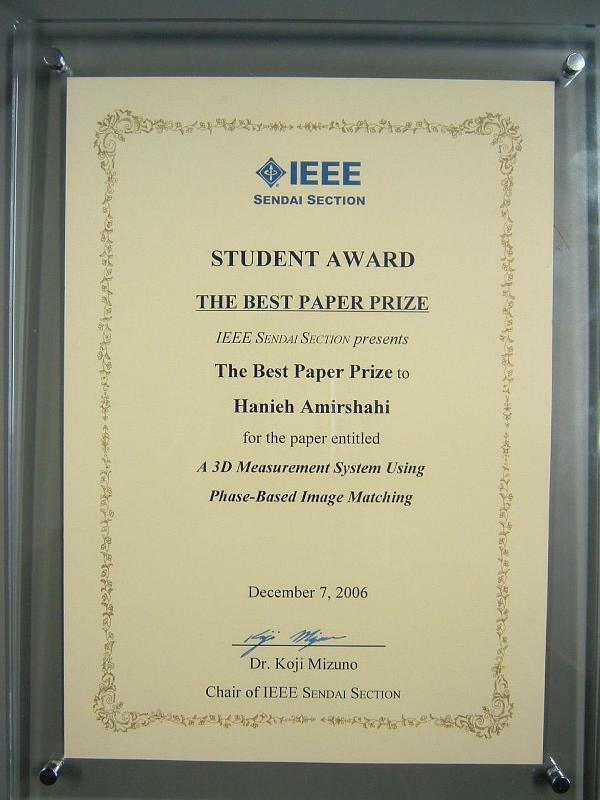 - Design Methodology and Validity Verification of EM Attack Sensor," pp. 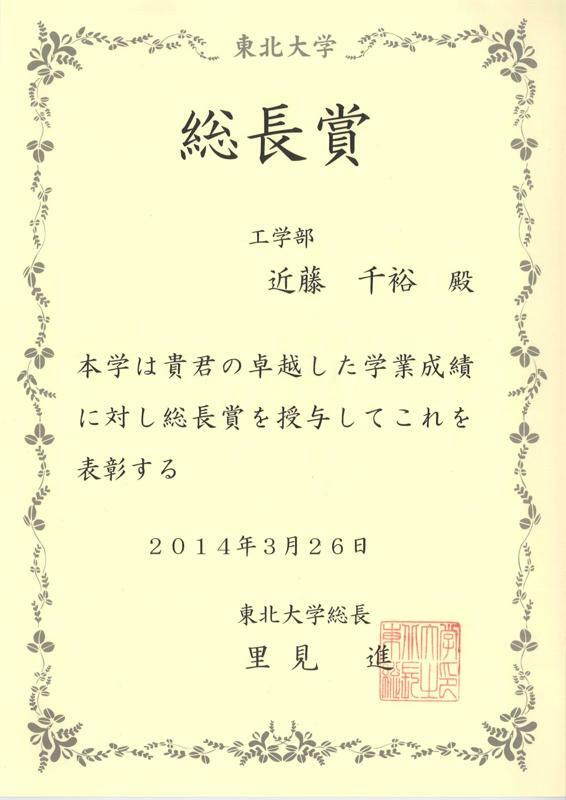 1-16, September 2014. 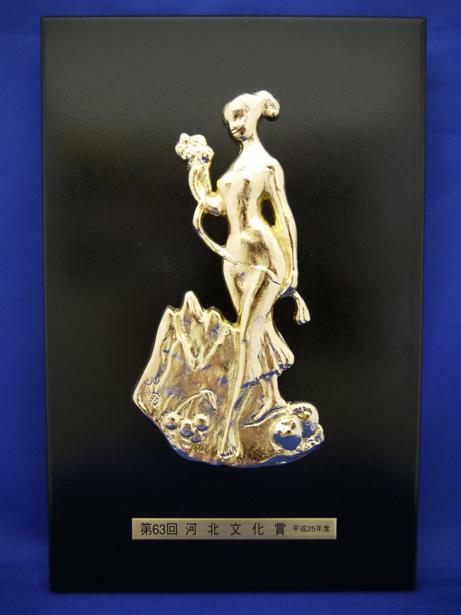 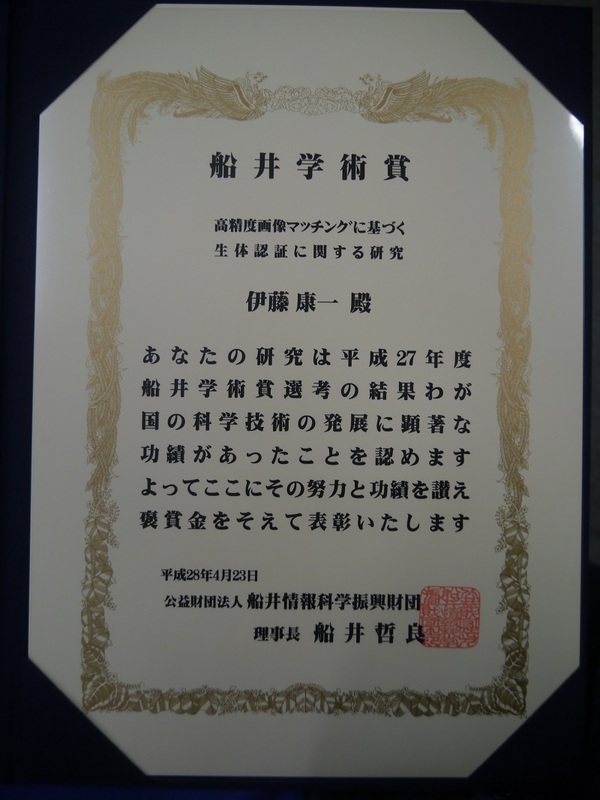 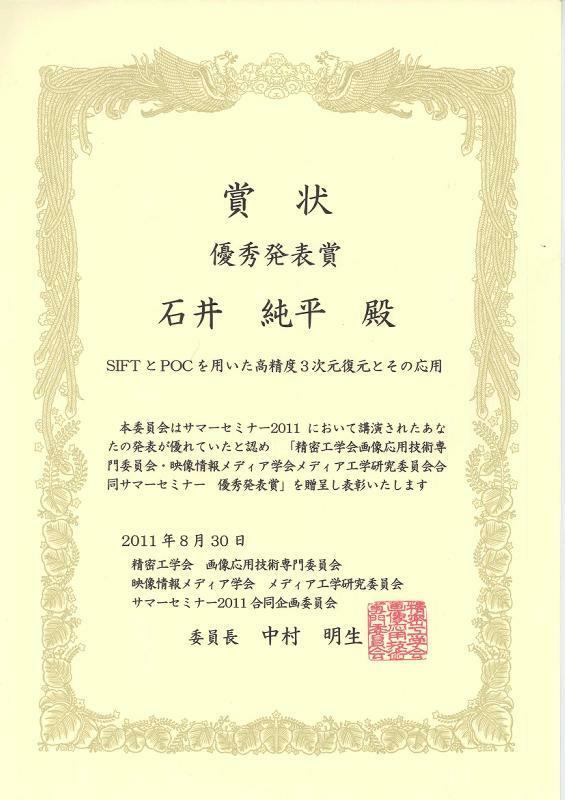 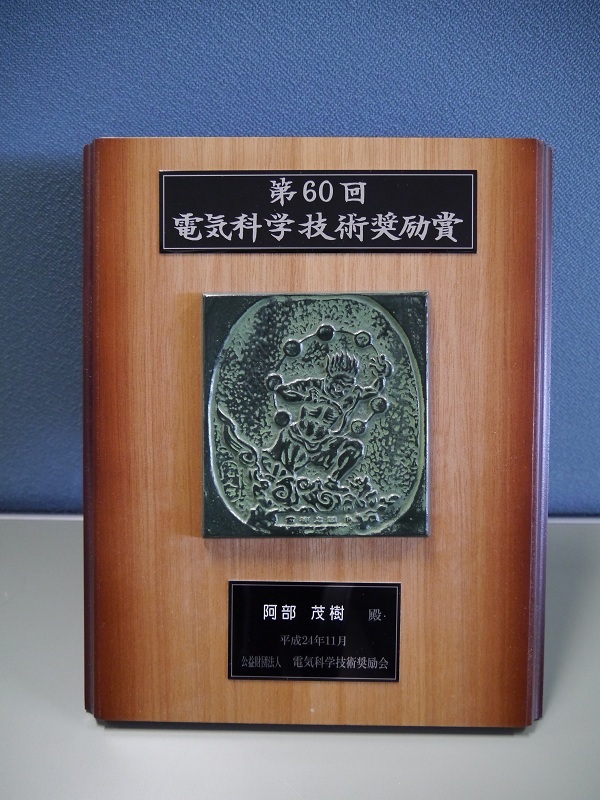 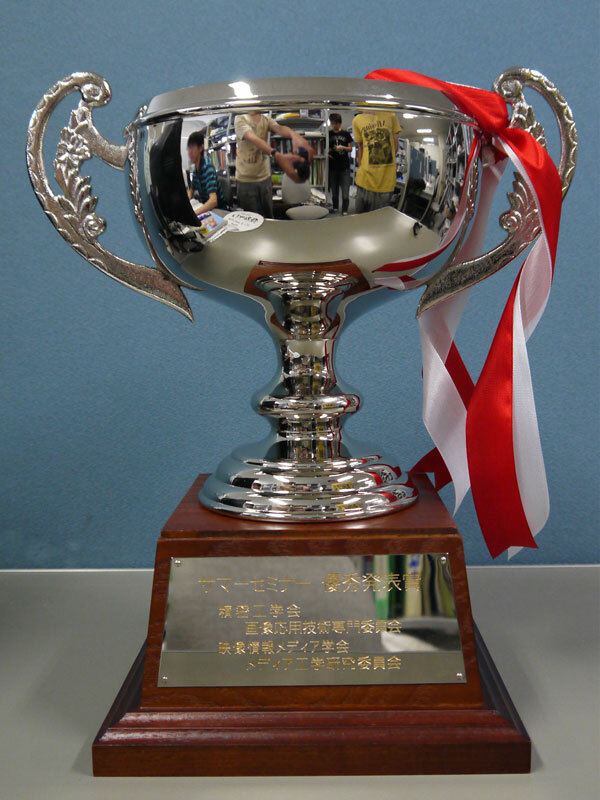 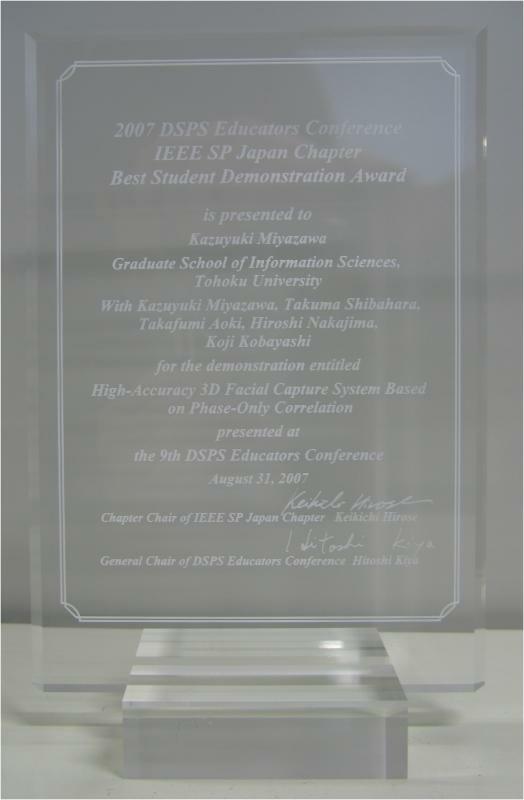 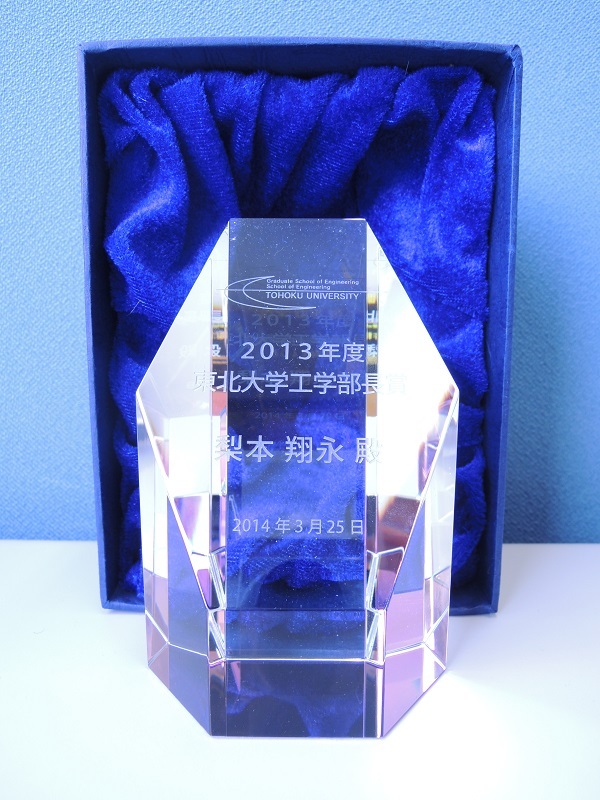 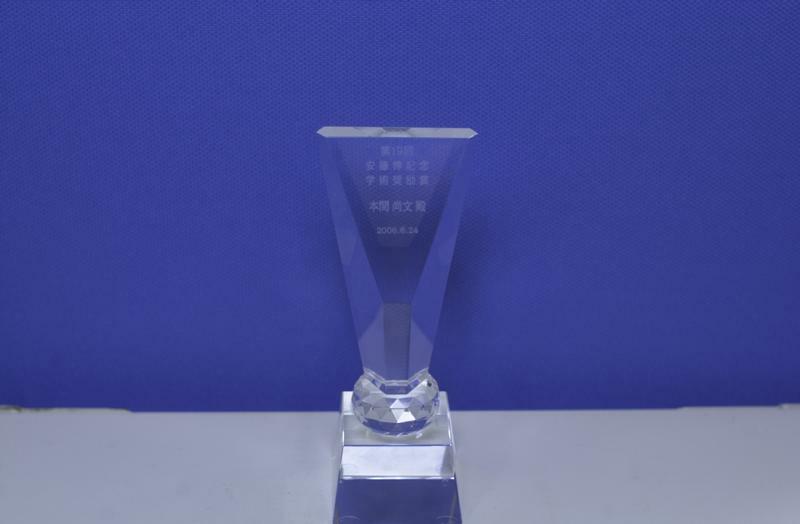 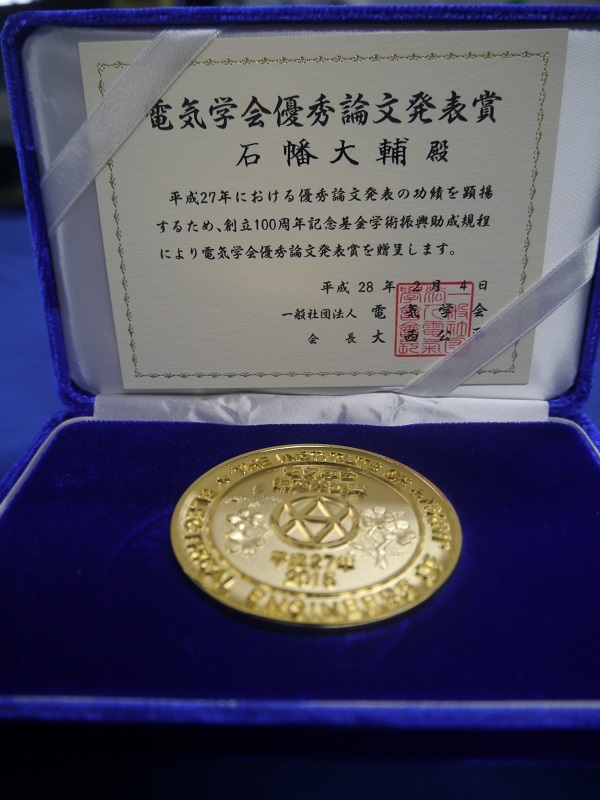 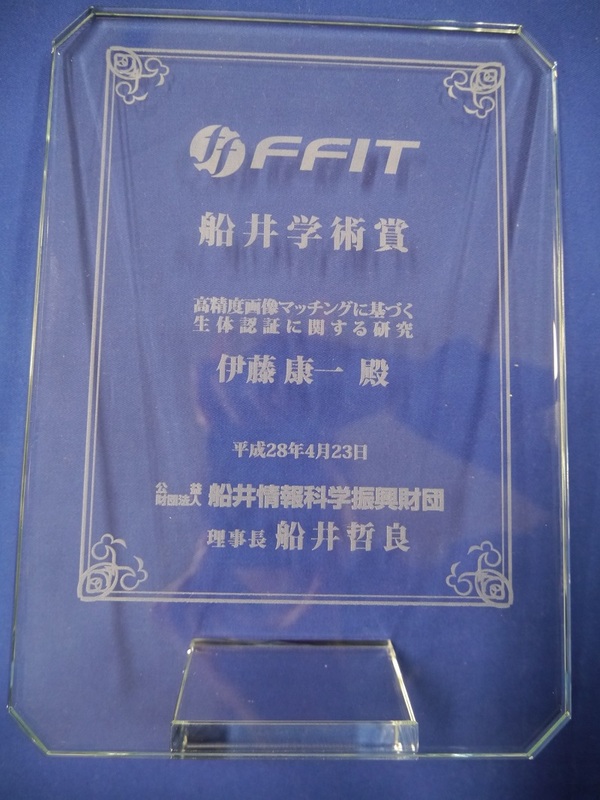 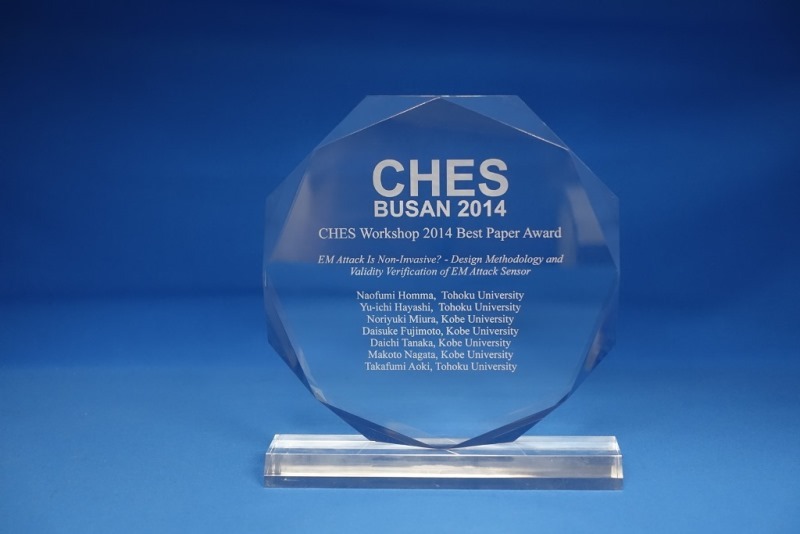 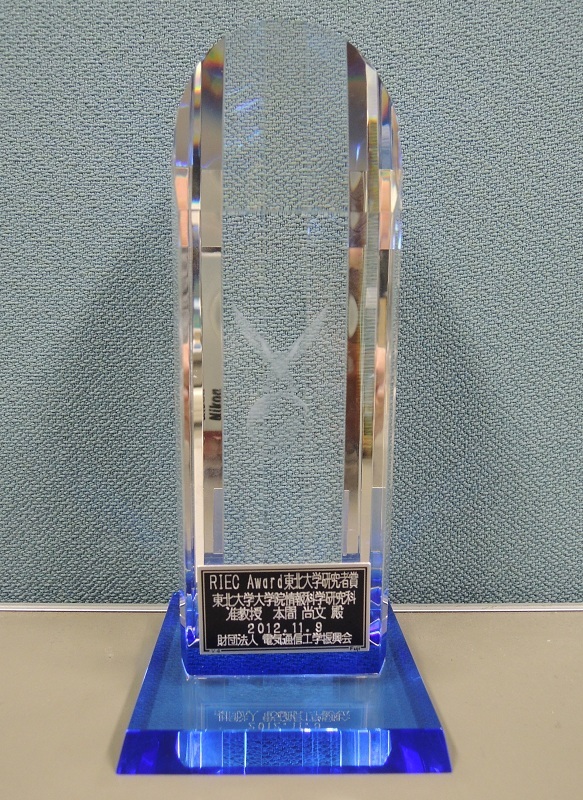 "賞牌"
Best Symposium Paper Award  Y. Hayashi, N. Homma, T. Mizuki, T. Aoki and H. Sone, "Map-based Analysis of IEMI Fault Injection into Cryptographic Devices," IEEE International Symposium on Electromagnetic Compatibility, pp. 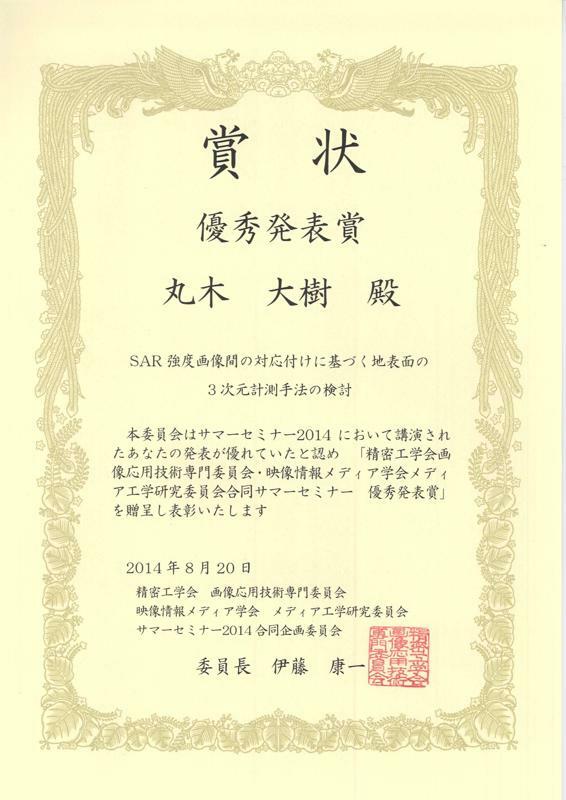 829--833, August 2013. 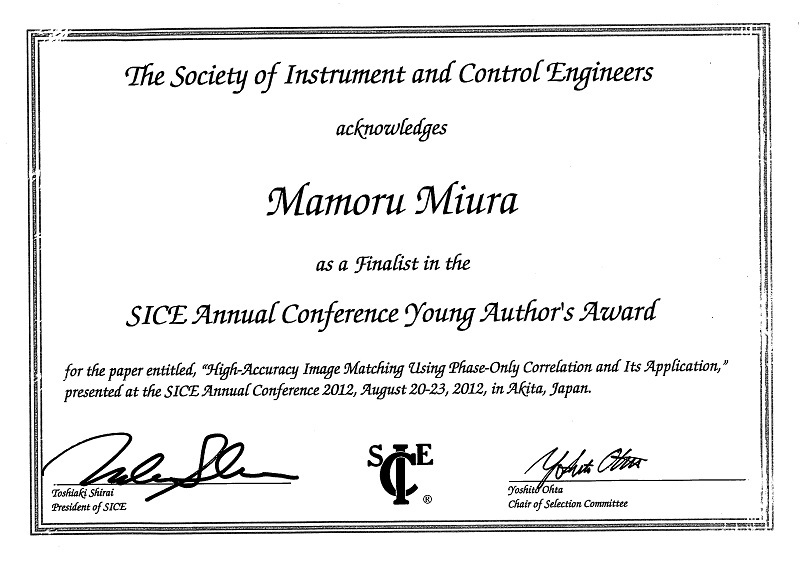 A Finalist in the SICE Annual Conference Young Author's Award  Mamoru Miura, "High-Accuracy Image Matching Using Phase-Only Correlation and Its Application," SICE Annual Conference 2012, No. 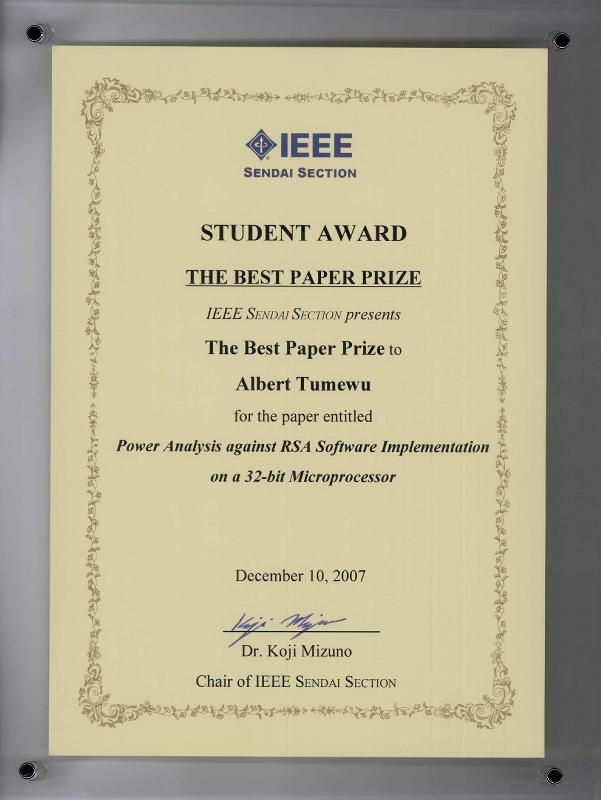 TuA11-04, pp. 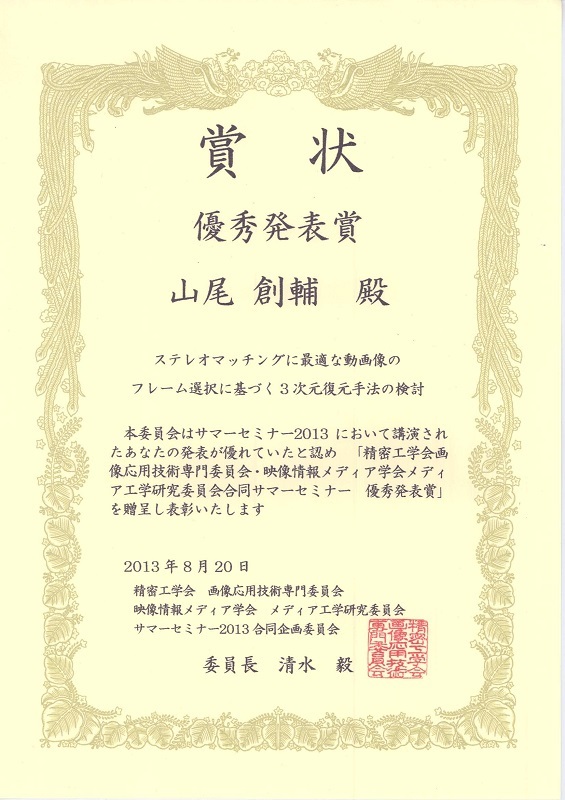 307--312, August 2012. 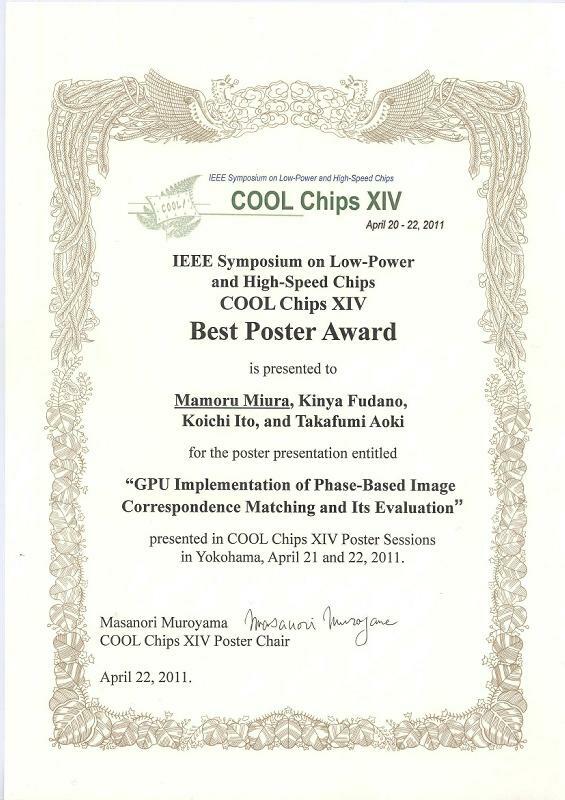 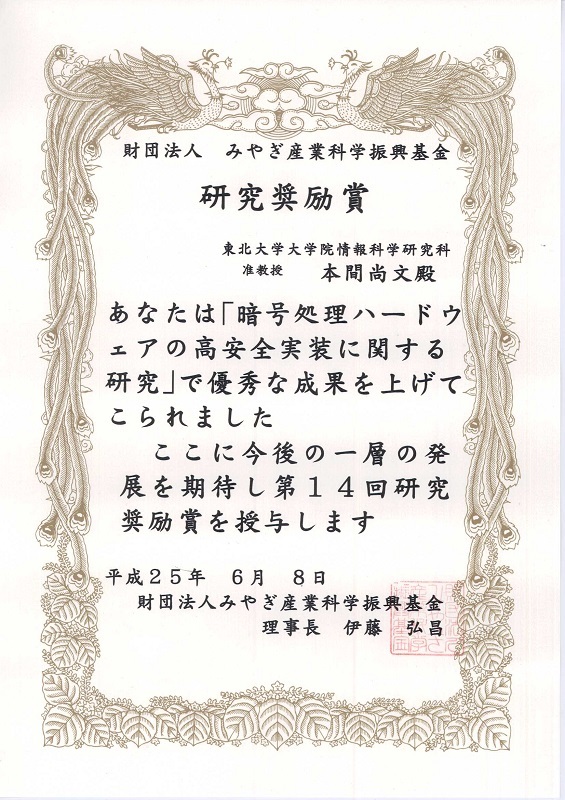 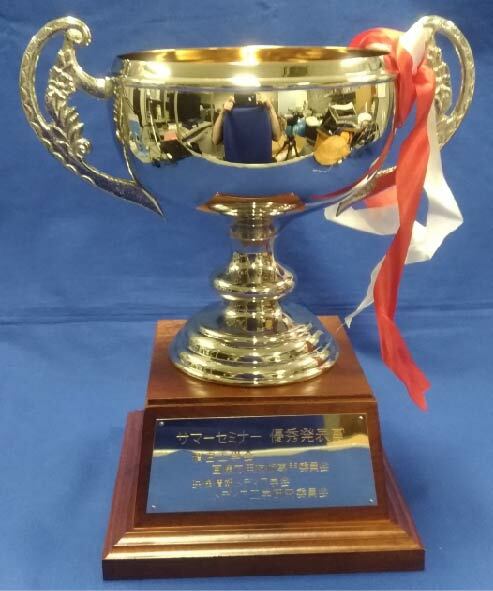 "賞状"
COOL Chips Best Poster Award  Mamoru Miura, Kinya Fudano, Koichi Ito and Takafumi Aoki, "GPU implementation of phase-based image correspondence matching and its evaluation," IEEE Symposium on Low-Power and High-Speed Chips (COOL Chips XIV), No. 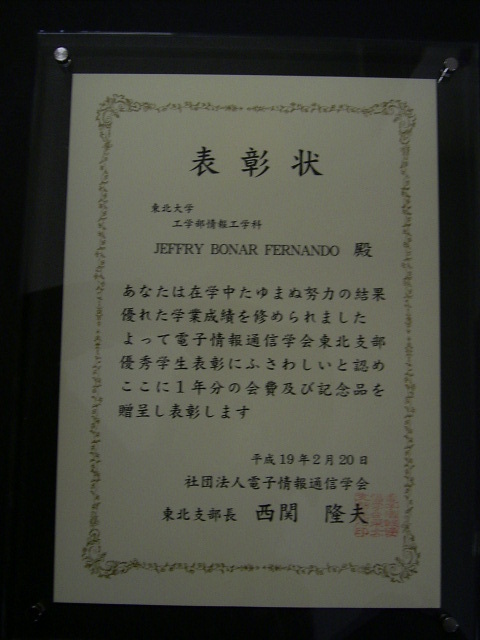 19, April 2011. 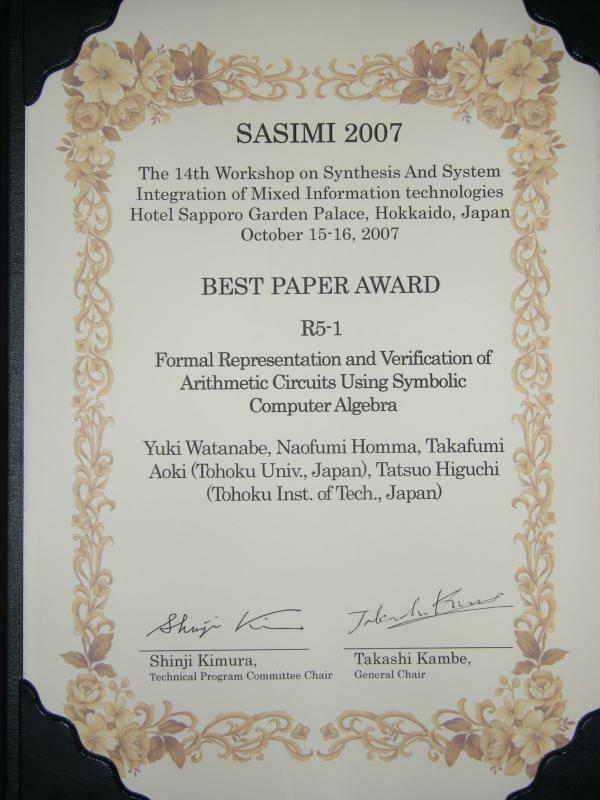 "賞状"
The 14th Workshop on Synthesis And System Integration of Mixed Information technologies (SASIMI2007) Best Paper Award  Yuki Watanabe, Naofumi Homma, Takafumi Aoki and Tatsuo Higuchi, "Formal Representation and Verification of Arithmetic Circuits Using Symbolic Computer Algebra" "賞状"
IEEE 多値論理国際シンポジウム Outstanding Contributed Paper Award  Katsuhiko Degawa, Takafumi Aoki, Tatsuo Higuchi, Hiroshi Inokawa and Yasuo Takahashi, "A Two-Bit-per-Cell Content-Addressable Memory using Single-Electron Transistors," Proceedings of the 35th IEEE International Symposium on Multiple-Valued Logic, pp. 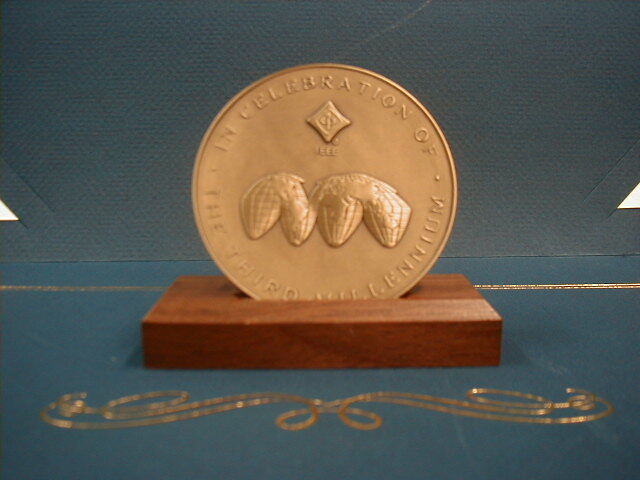 32--38, Canada, May 2005. 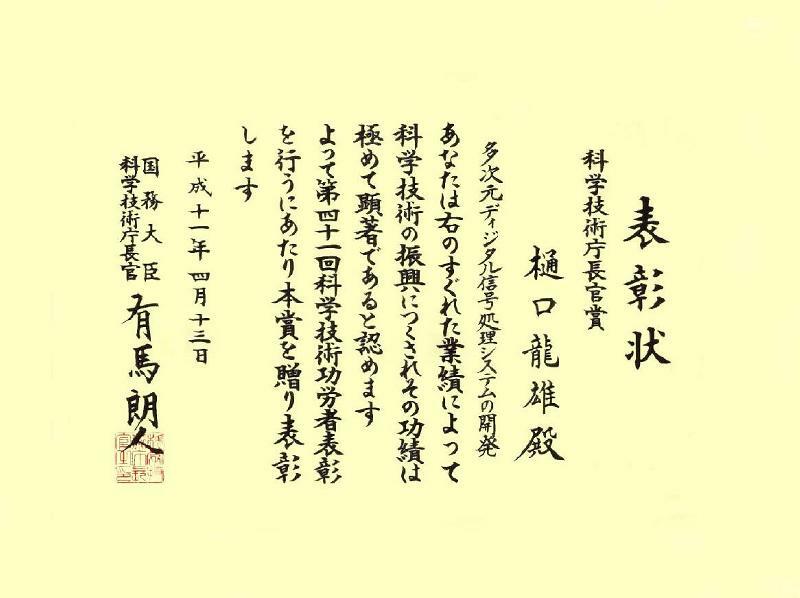 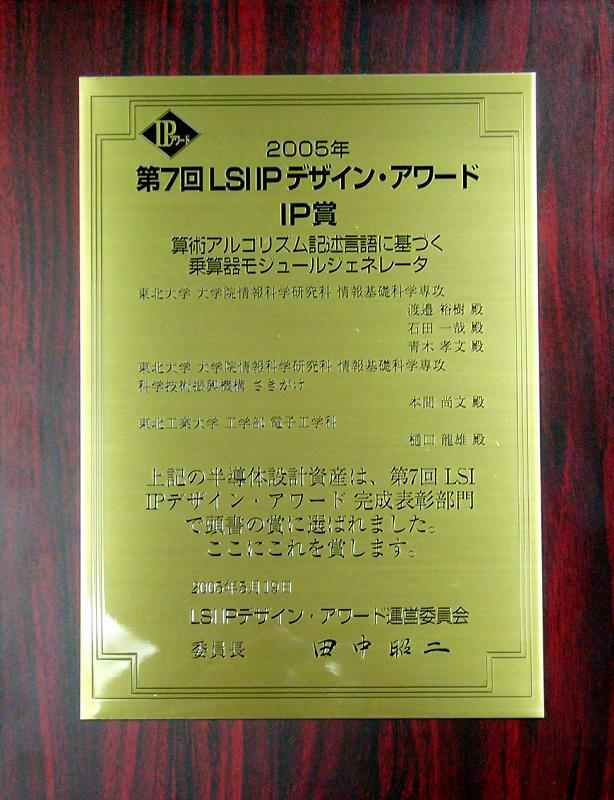 "賞状"
第7回LSI IPデザイン・アワード完成表彰部門 IP賞  渡邉裕樹，本間尚文，石田一哉，青木孝文，樋口龍雄：算術アルゴリズム記述言語に基づく乗算器モジュールジェネレータ "賞状"
IEEE 多値論理国際シンポジウム Outstanding Contributed Paper Award  Y. Yuminaka, O. Katoh, Y. Sasaki, T. Aoki and T. Higuchi : An Efficient Data Transmission Technique for VLSI Systems Based on Multiple-Valued Code-Division Multiple Access, IEEE Int. 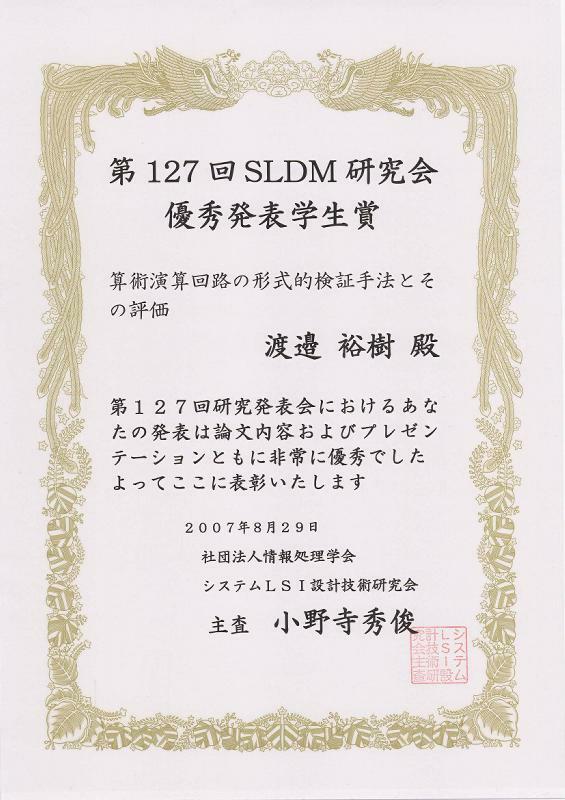 Symp. 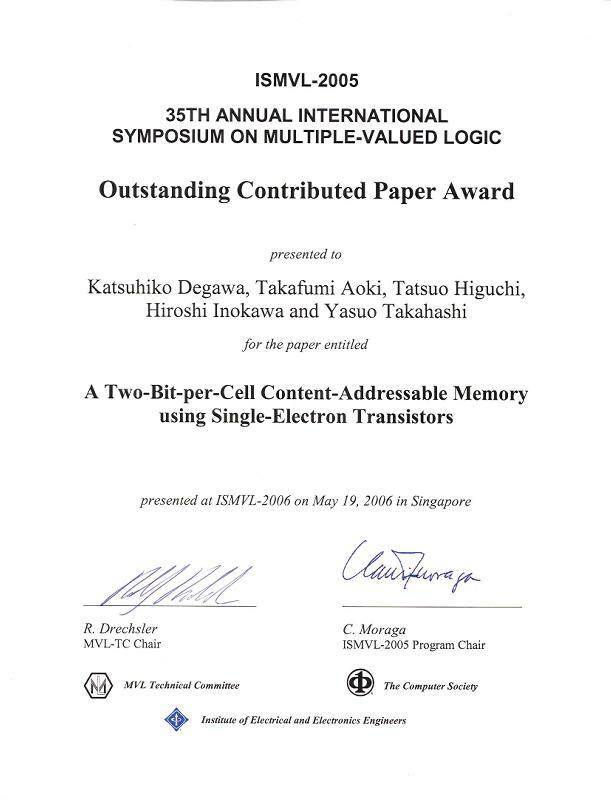 on Multiple - Valued Logic, pp. 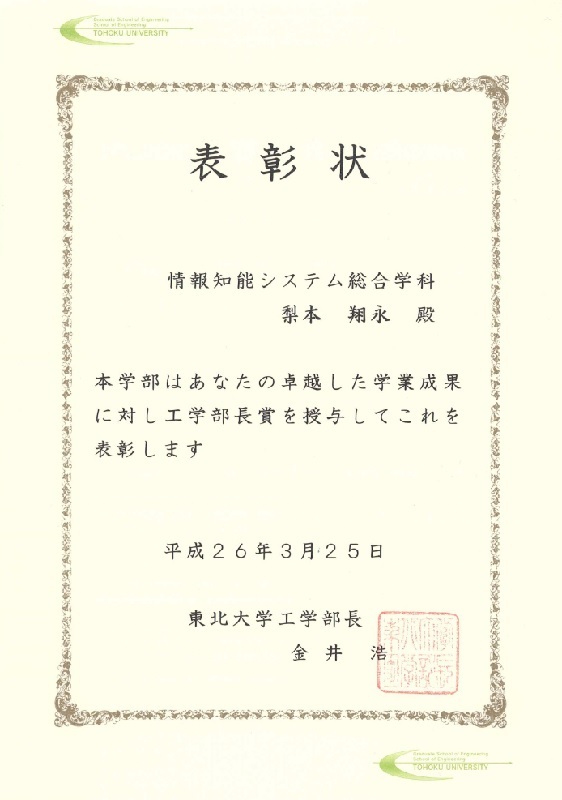 430 - 437 (2000). 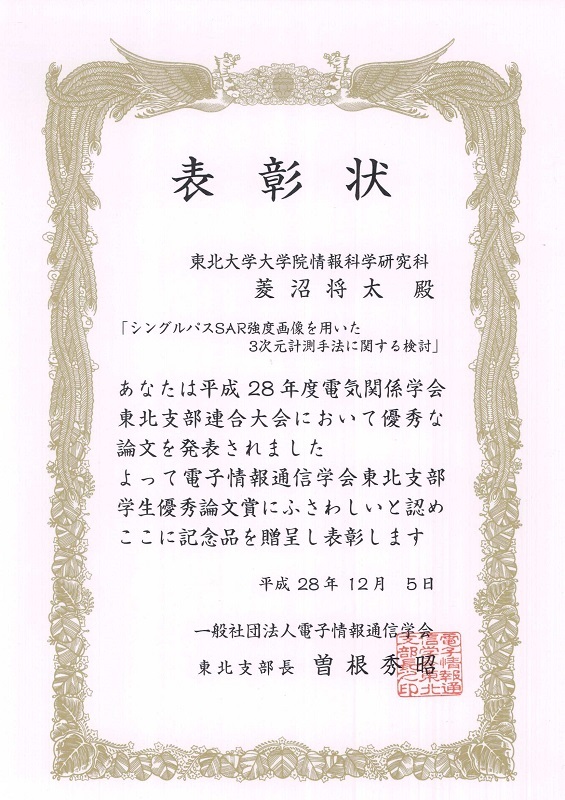 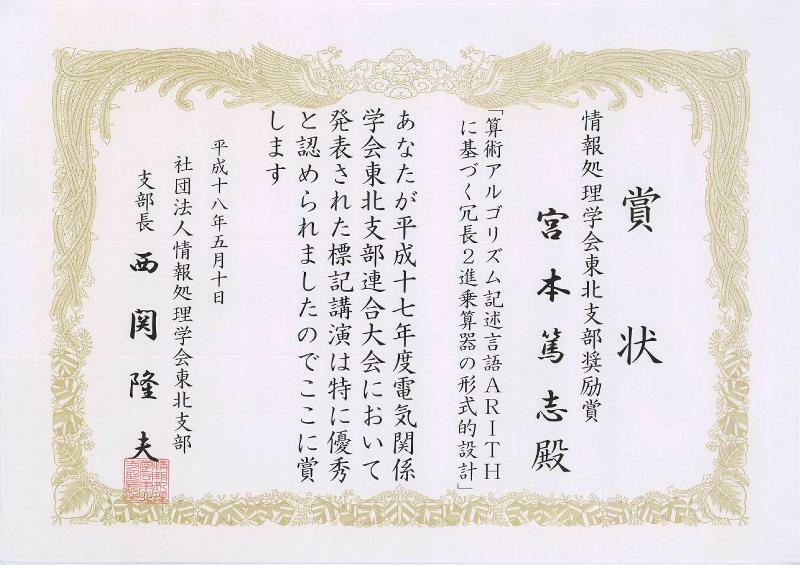 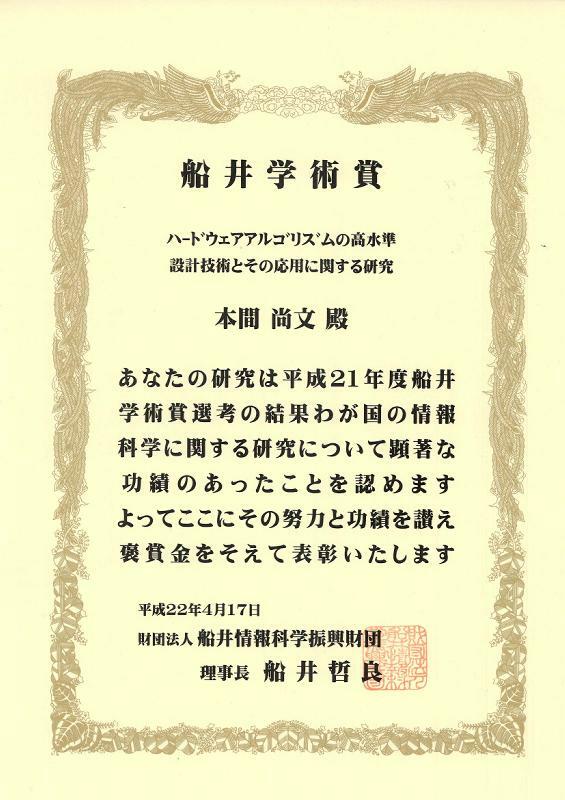 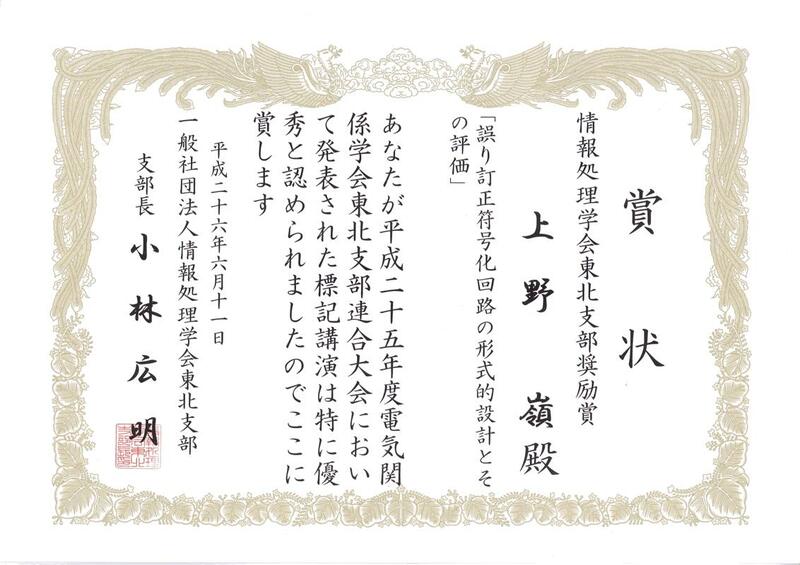 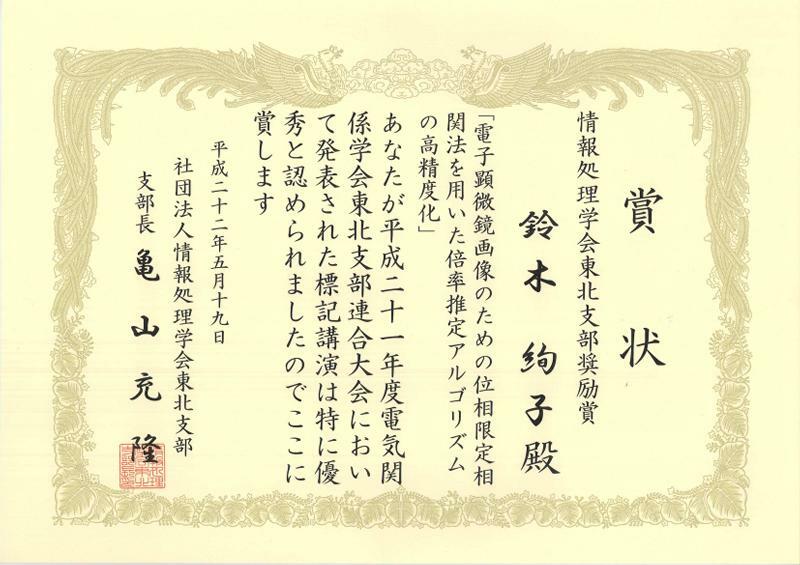 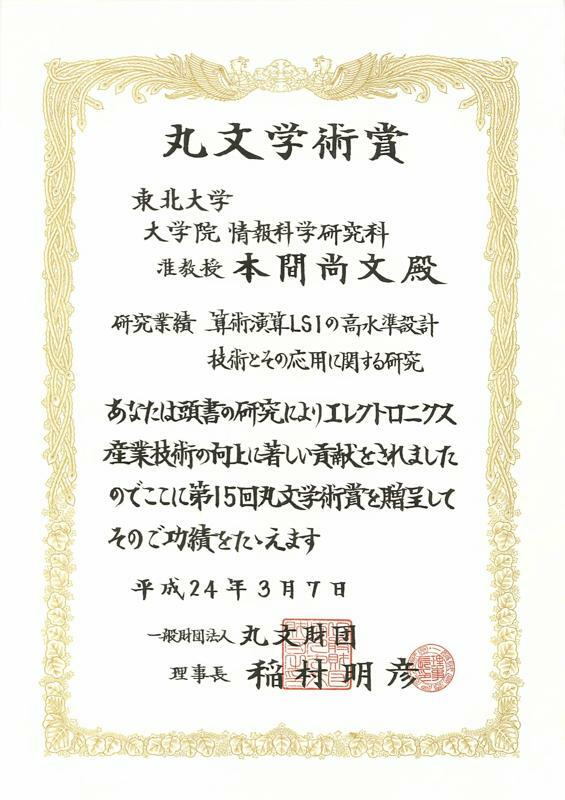 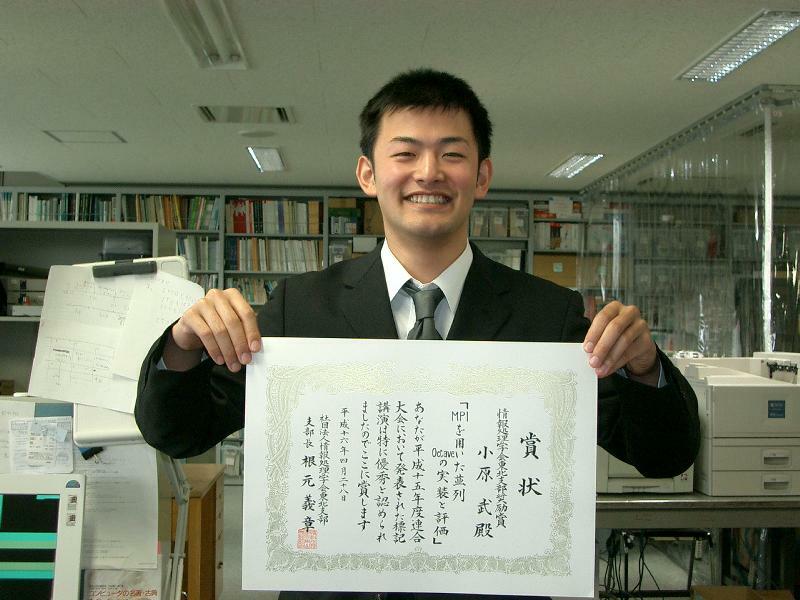 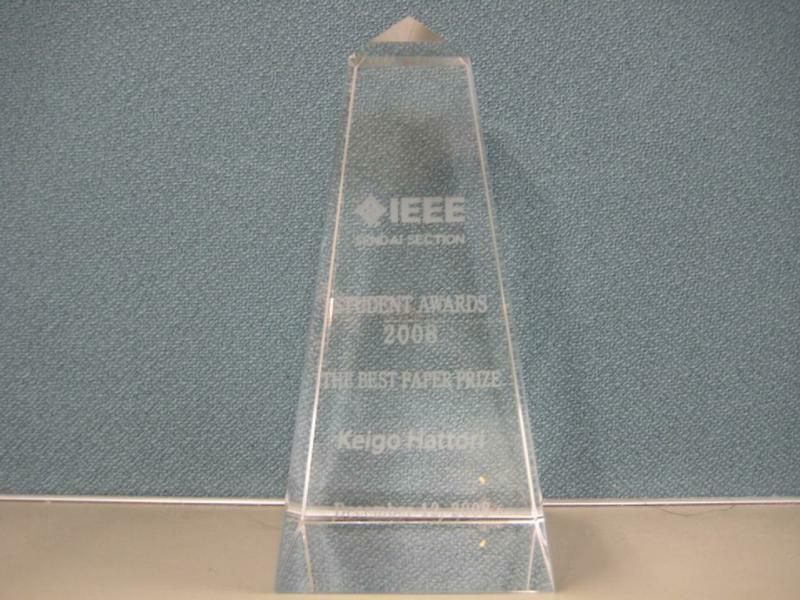 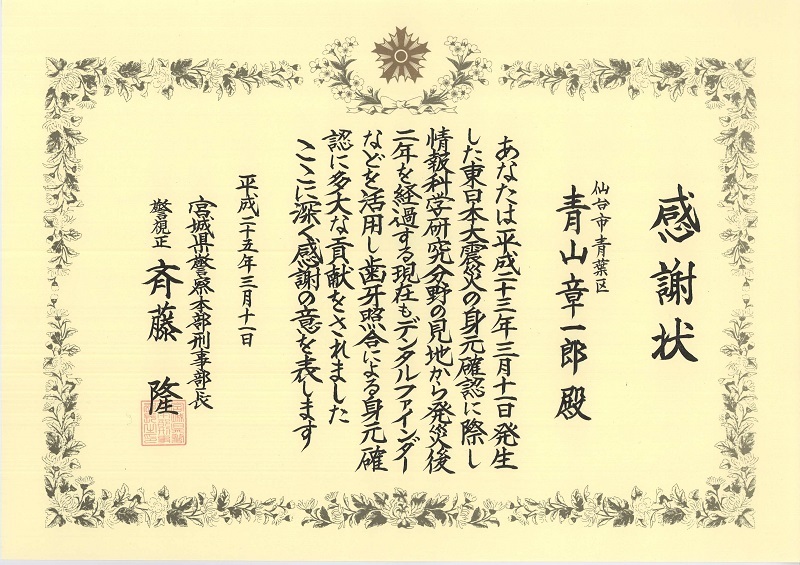 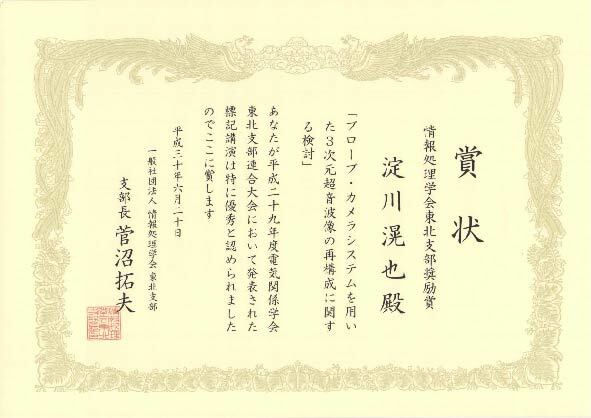 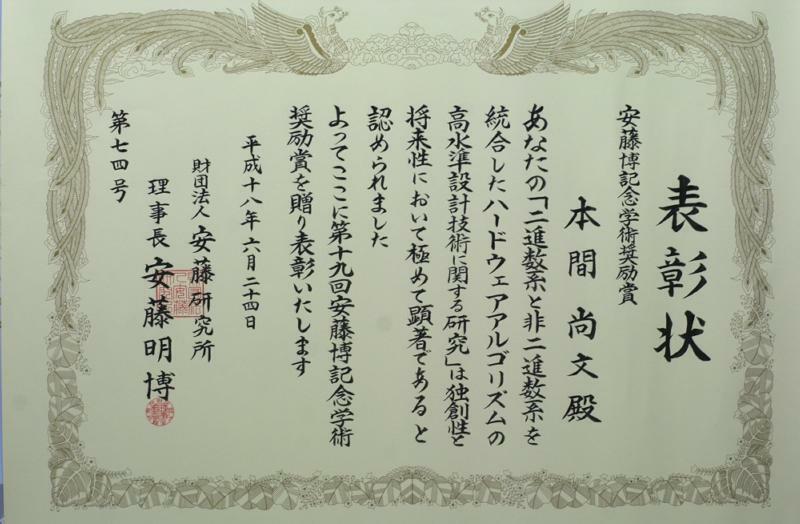 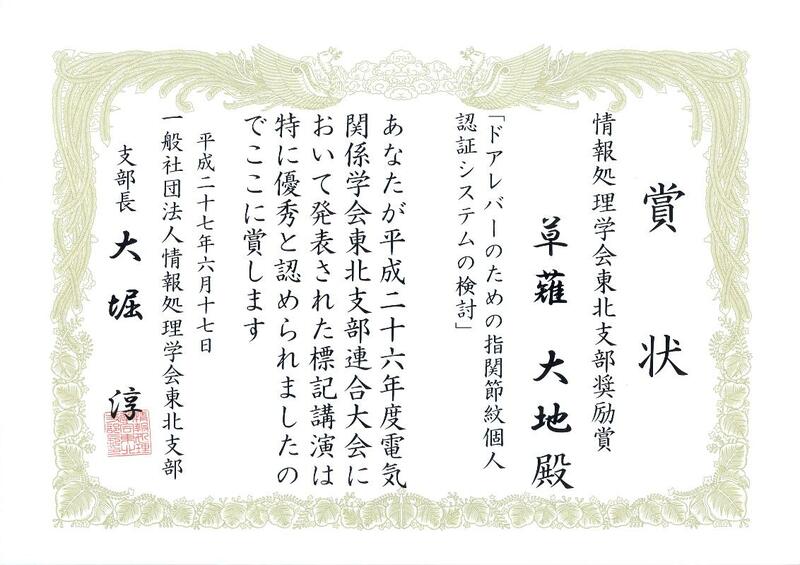 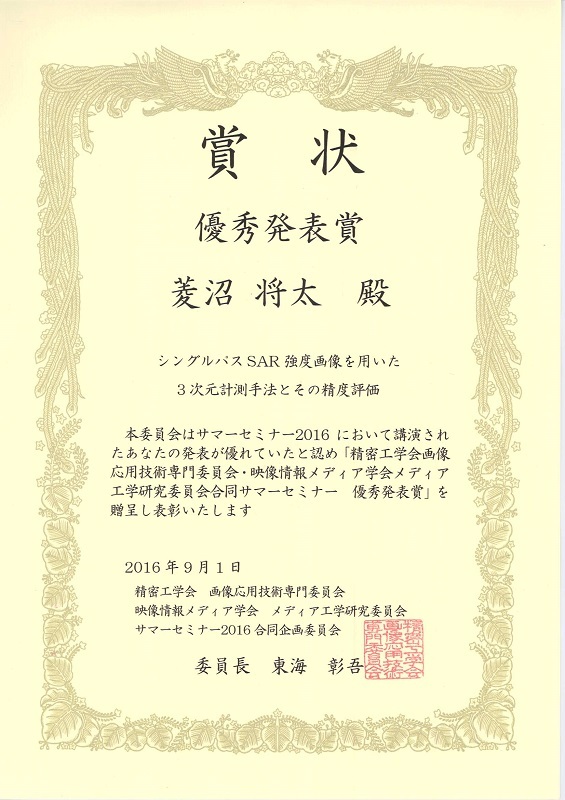 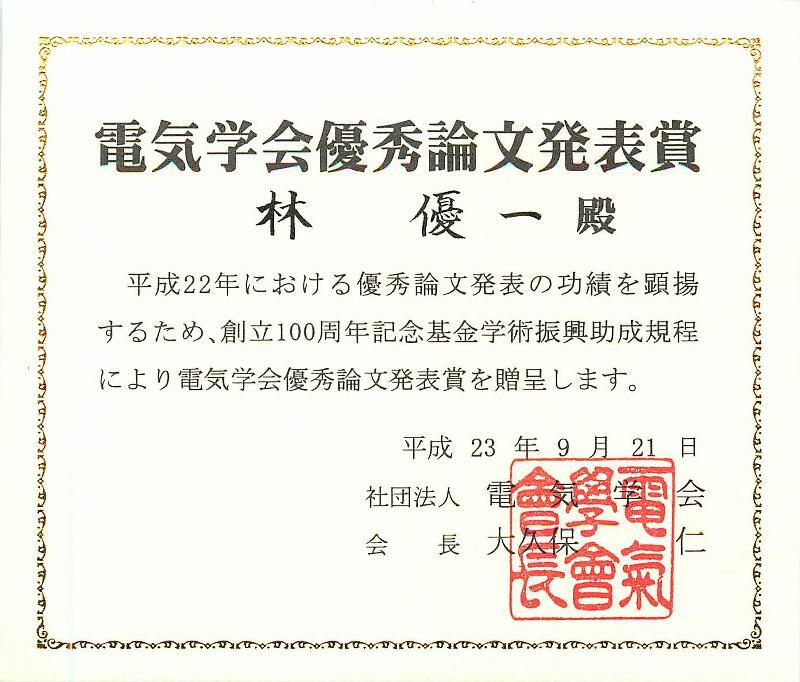 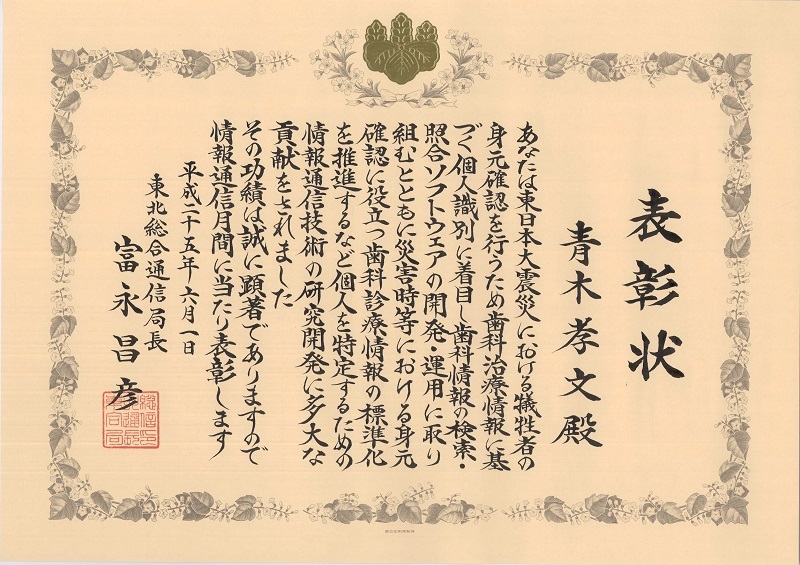 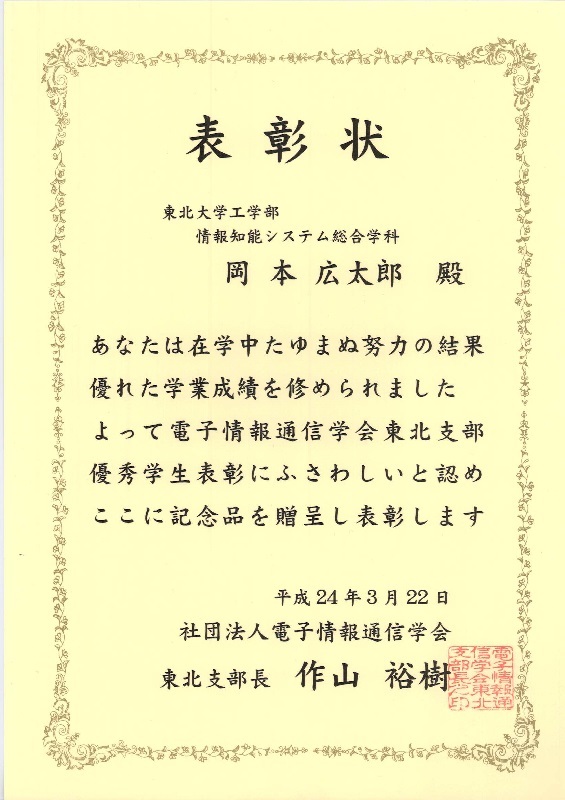 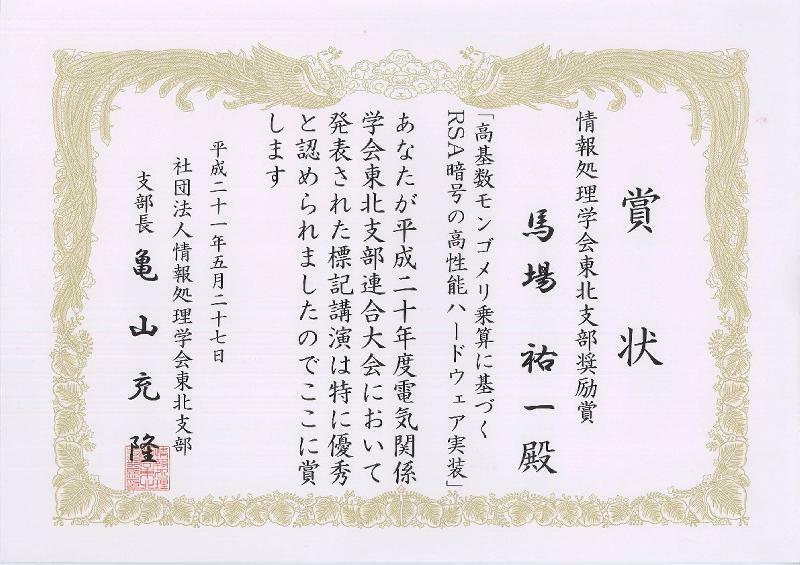 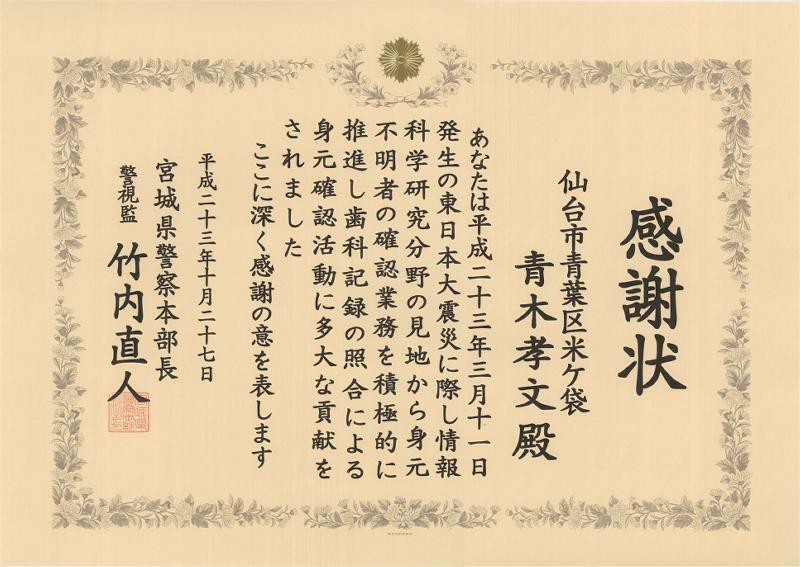 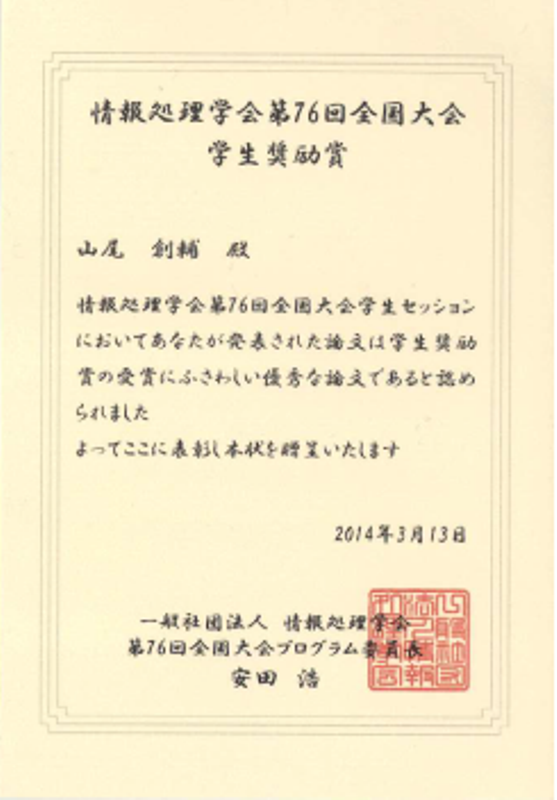 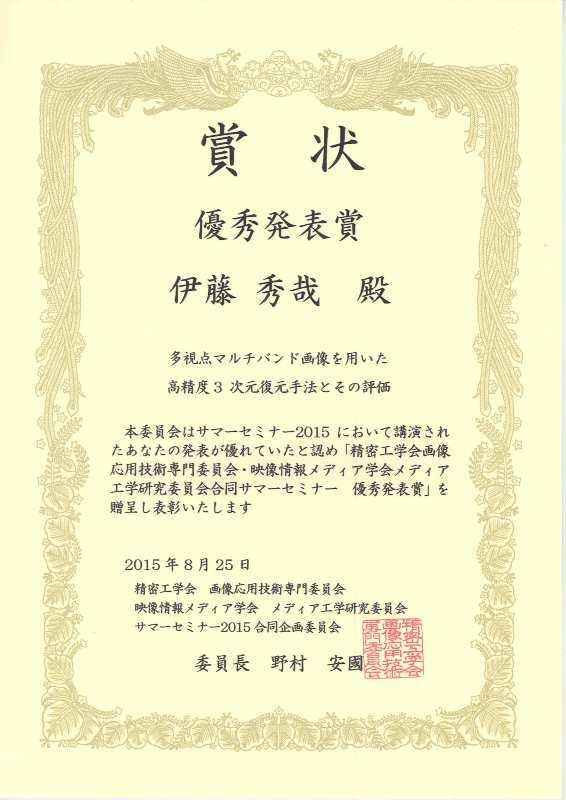 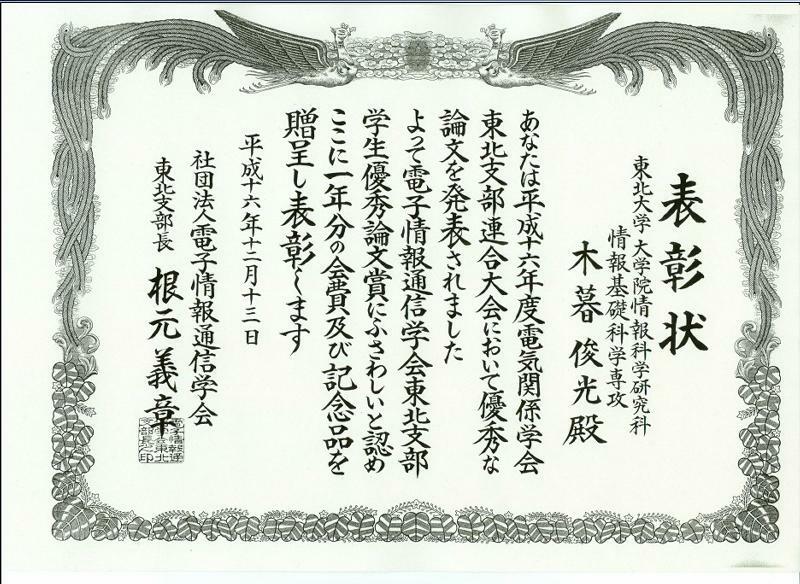 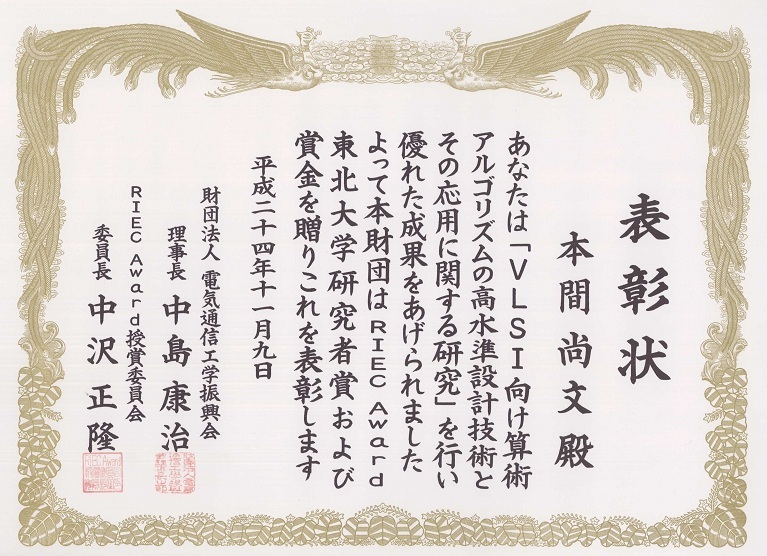 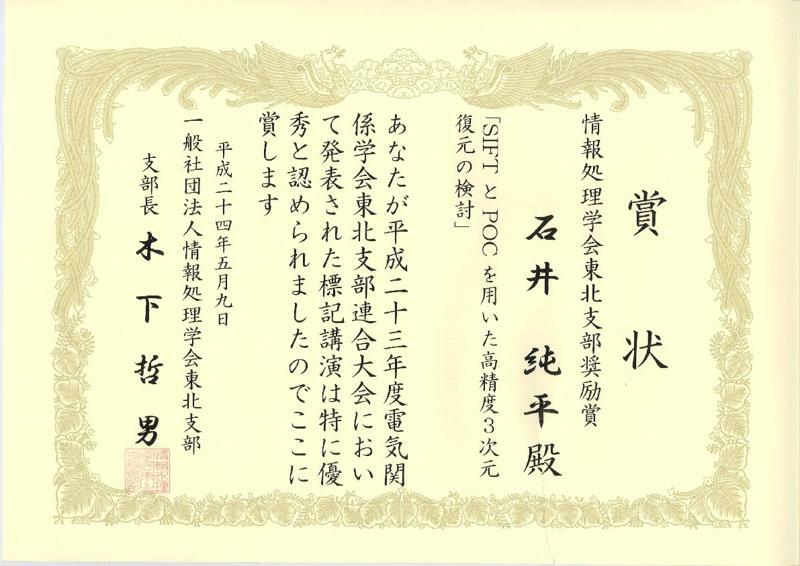 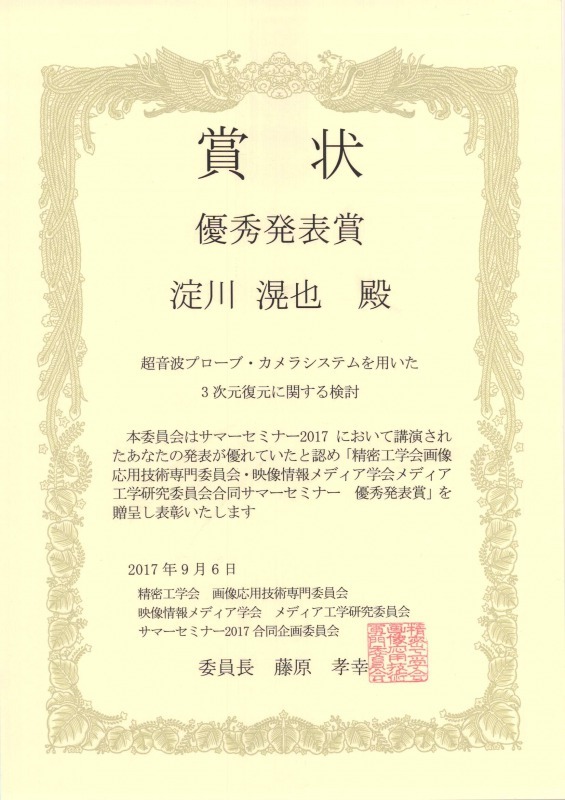 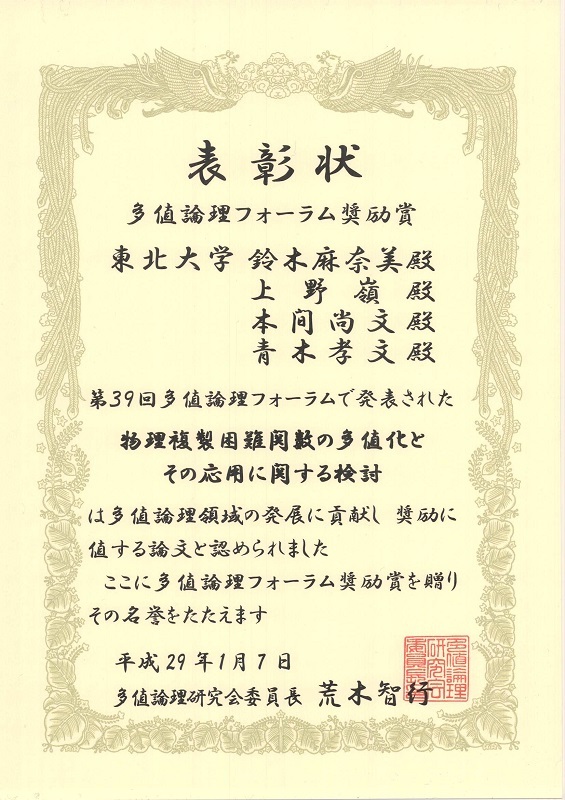 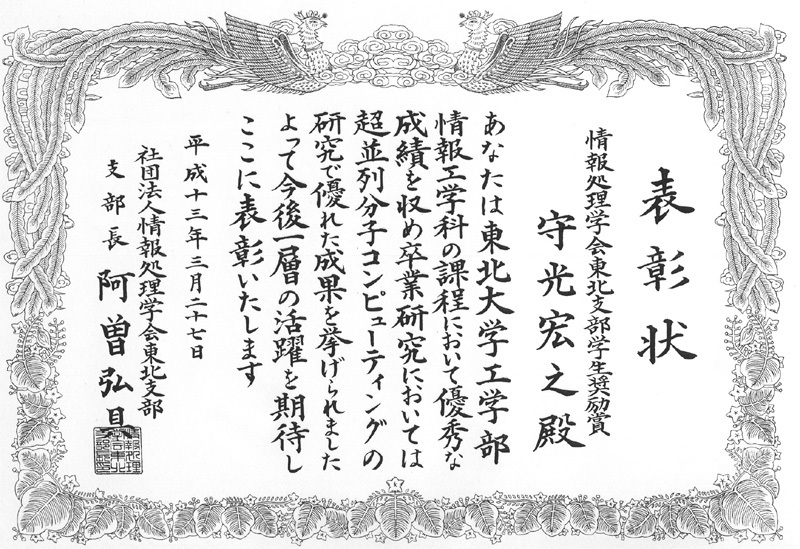 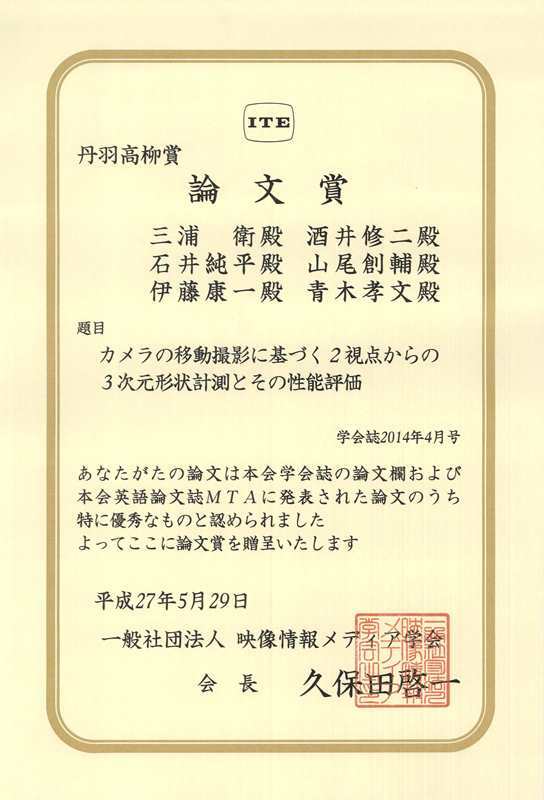 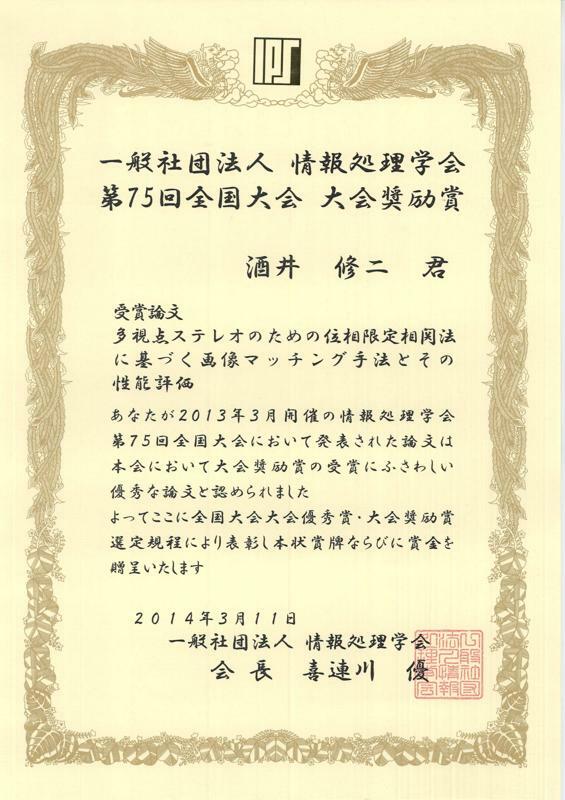 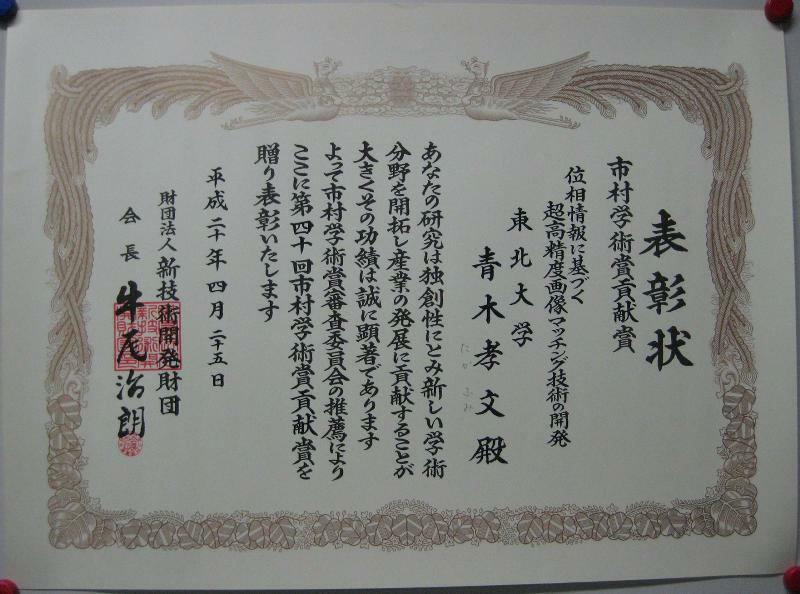 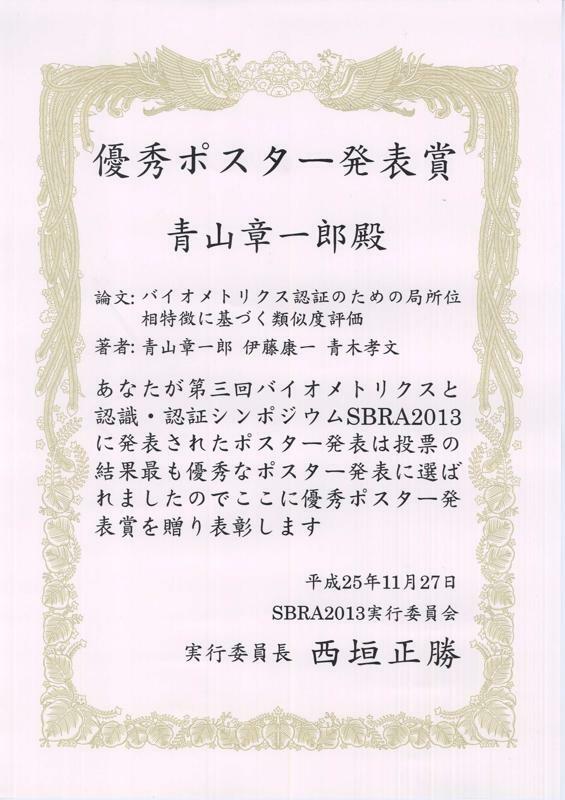 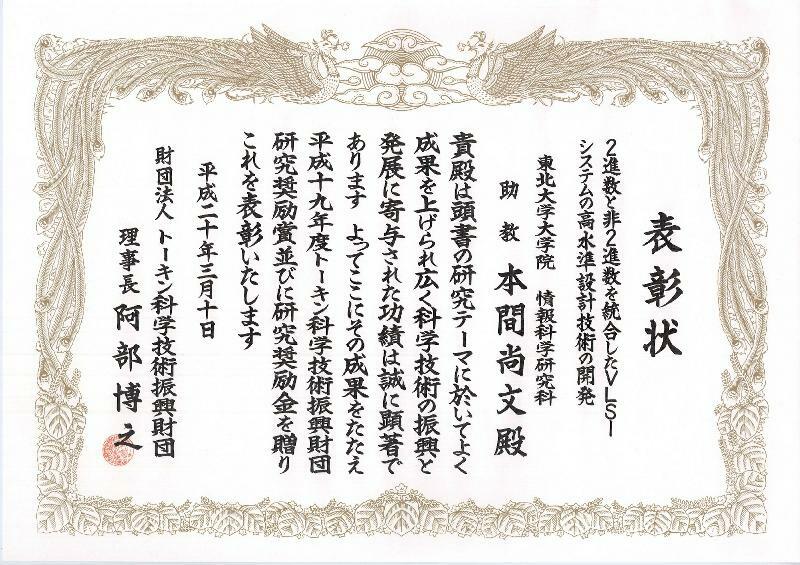 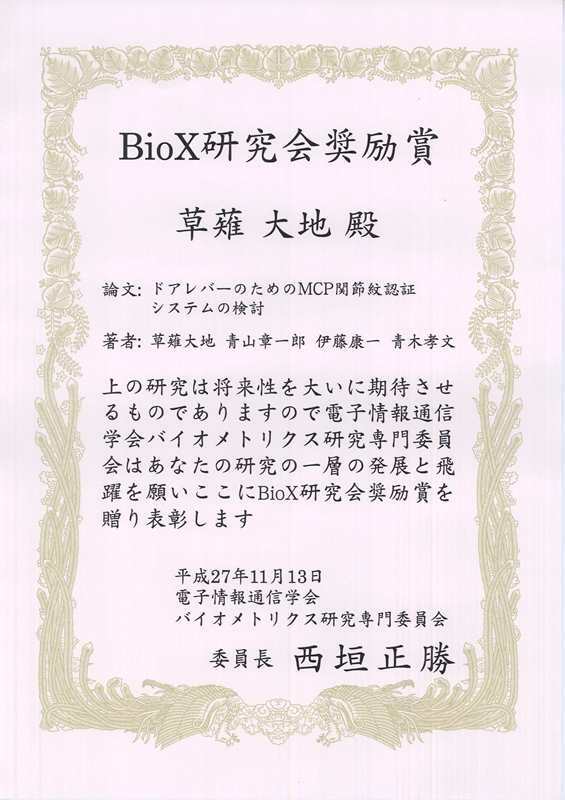 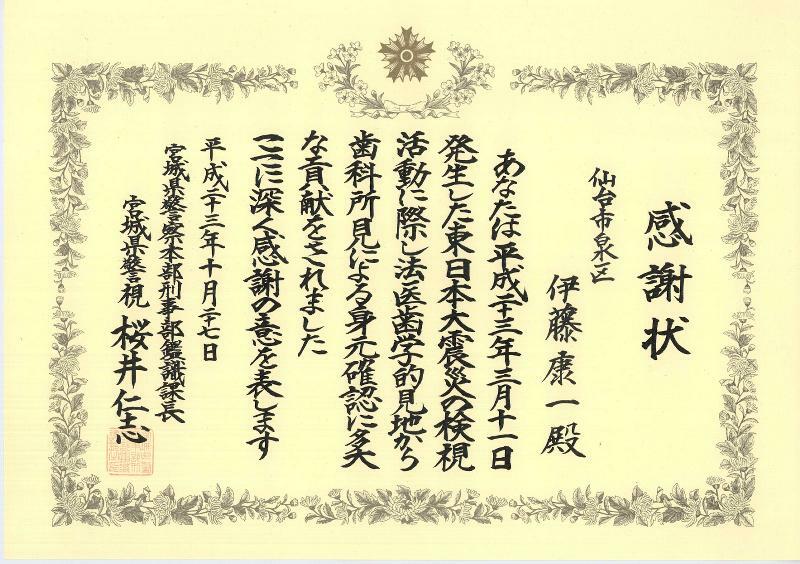 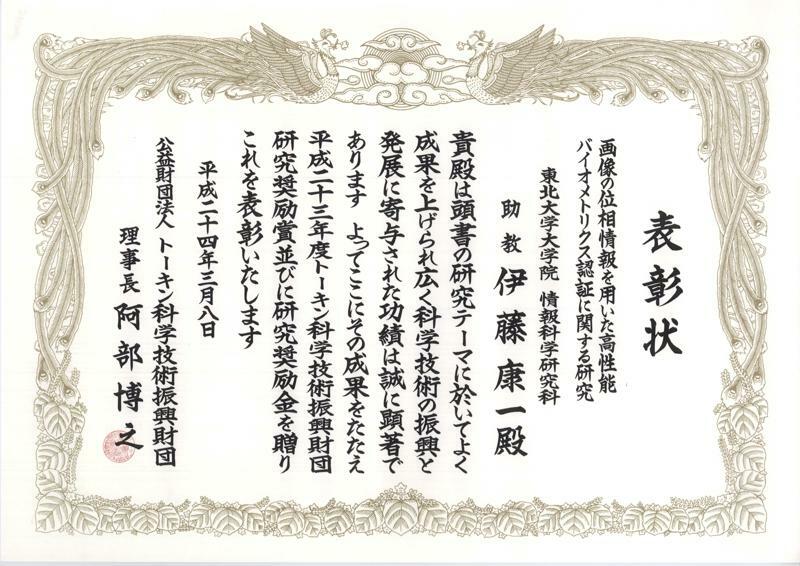 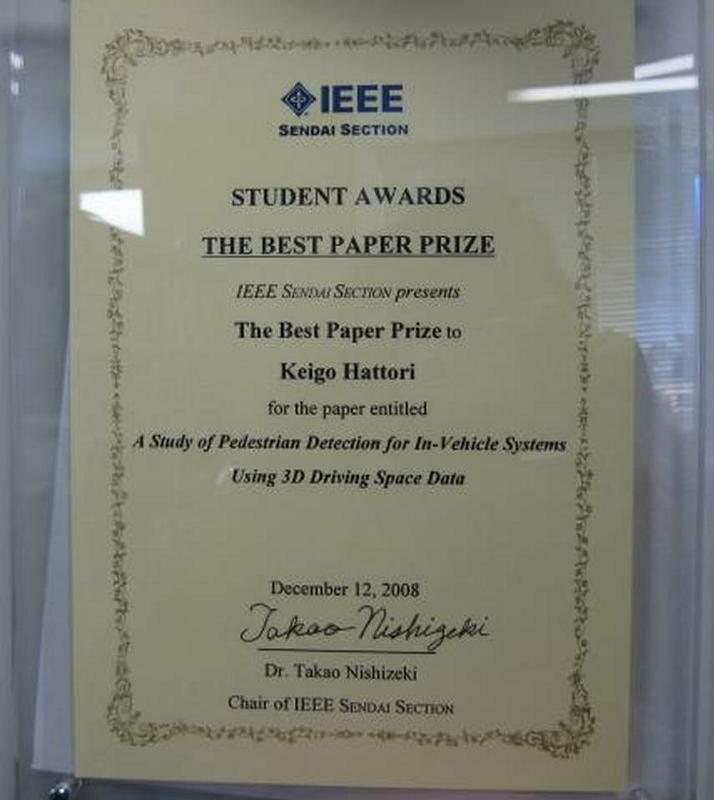 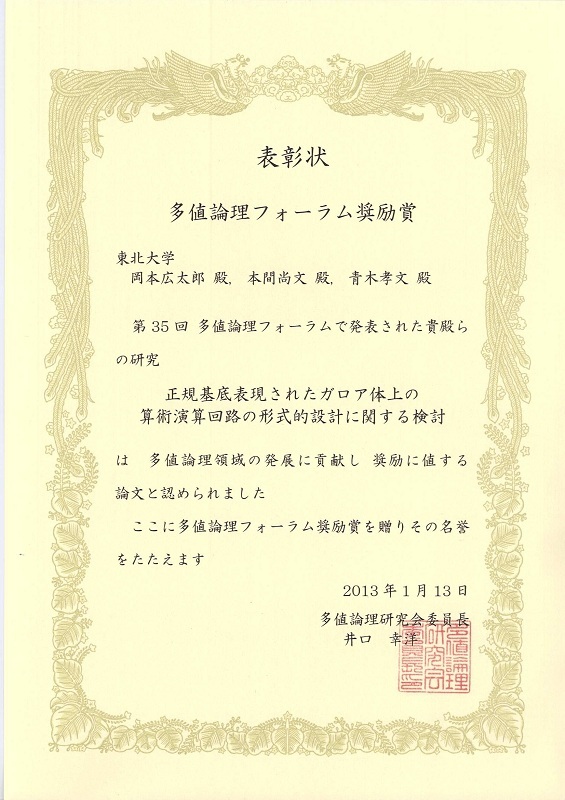 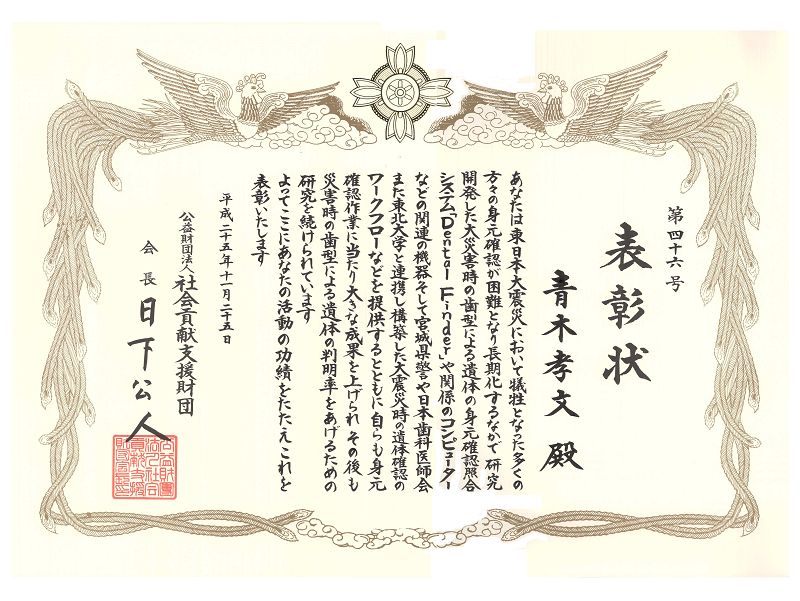 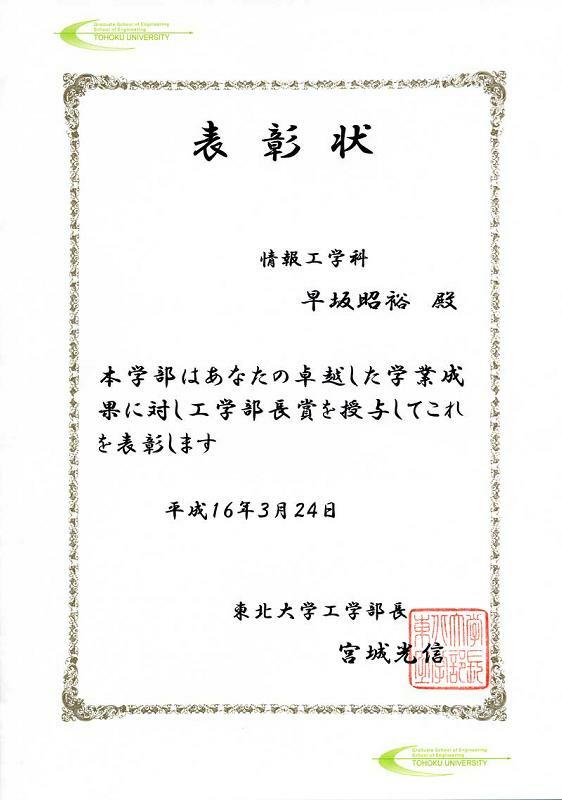 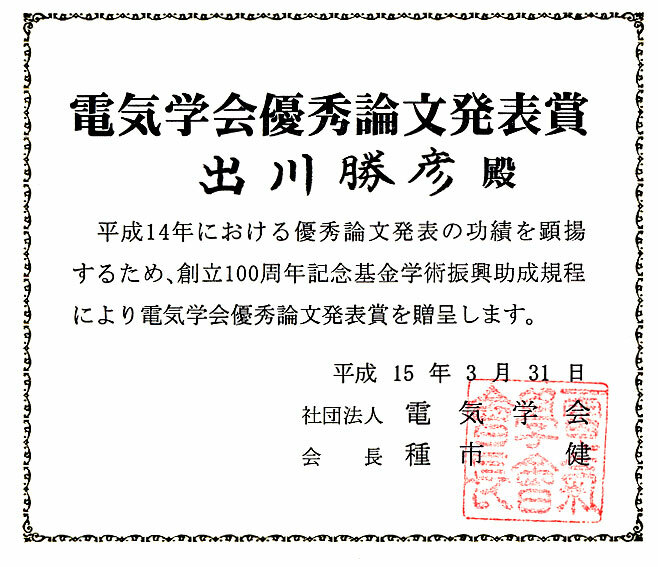 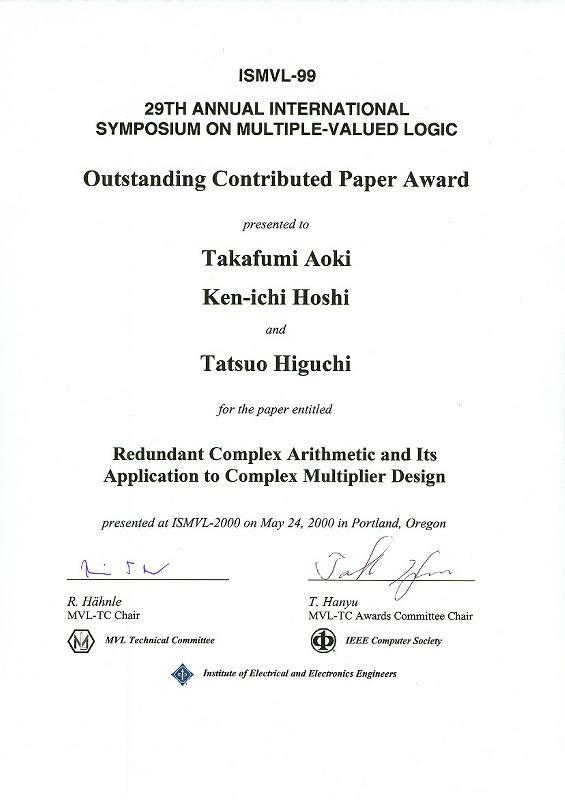 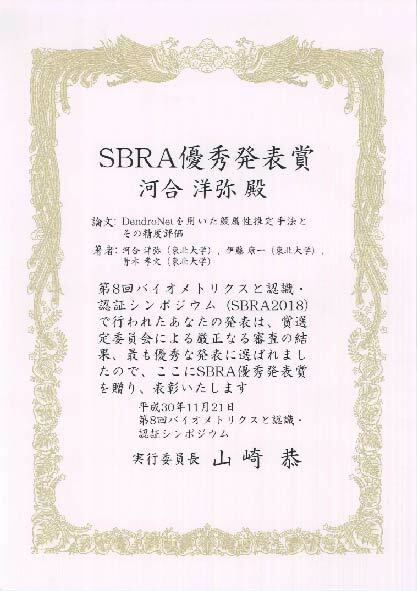 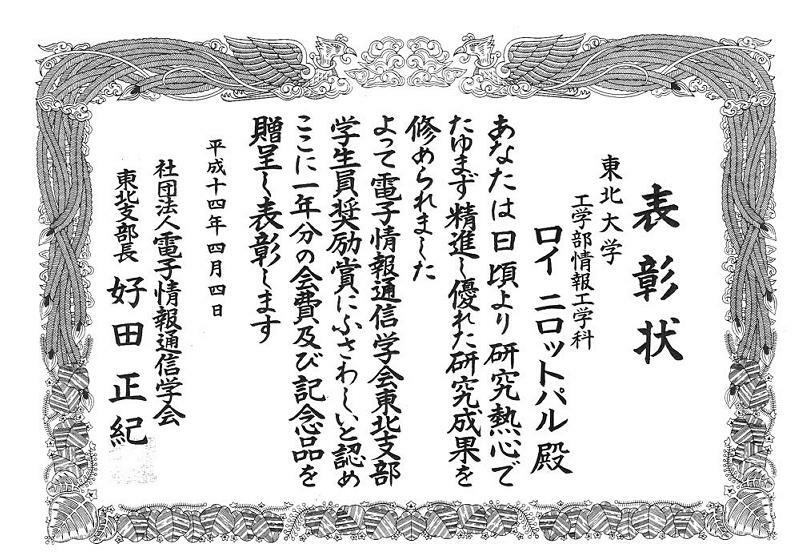 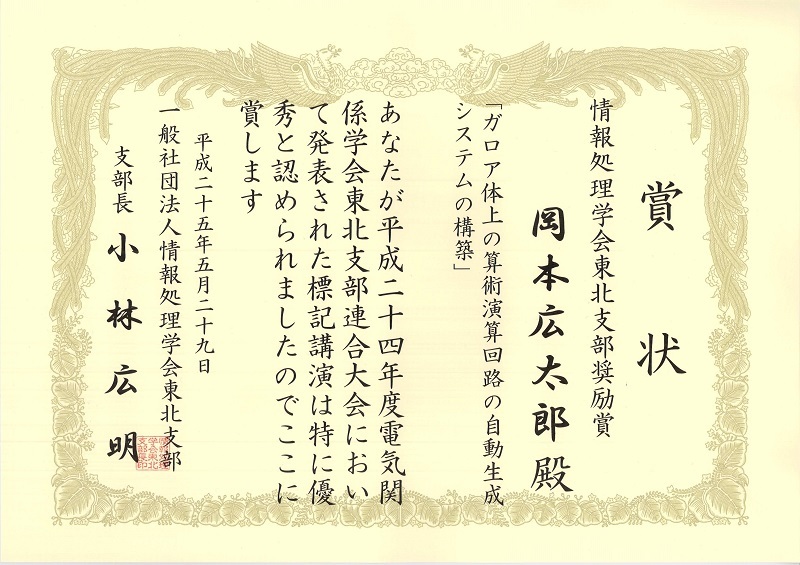 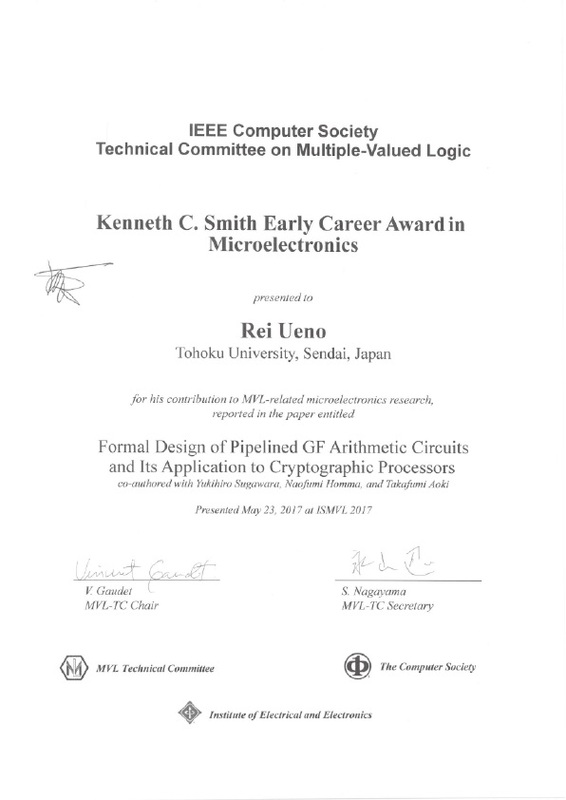 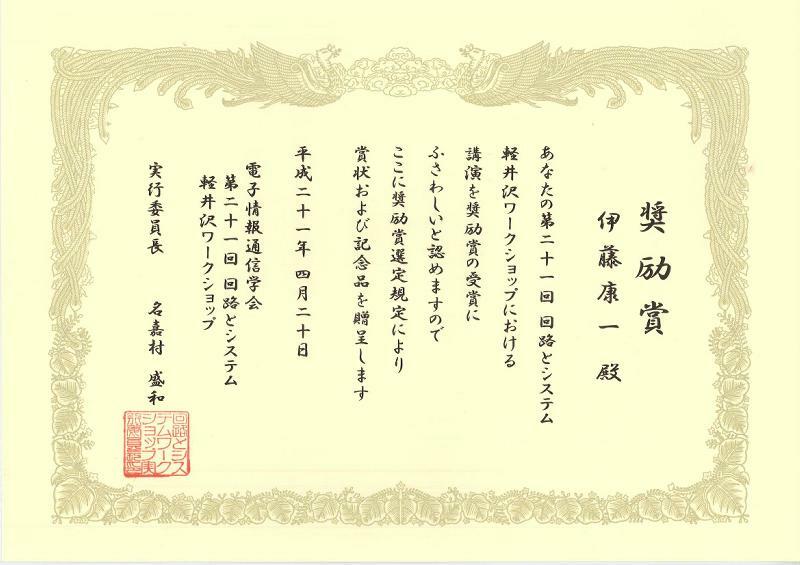 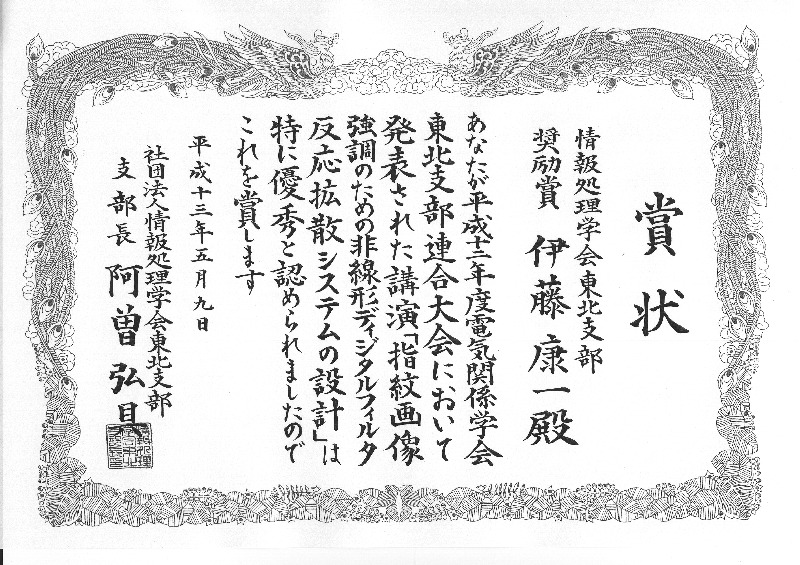 "賞状"
IEEE 多値論理国際シンポジウム Outstanding Contributed Paper Award  T. Aoki, K. Hoshi, and T. Higuchi : Redundant Complex Arithmetic and Its Application to Complex Multiplier Design, IEEE Int. 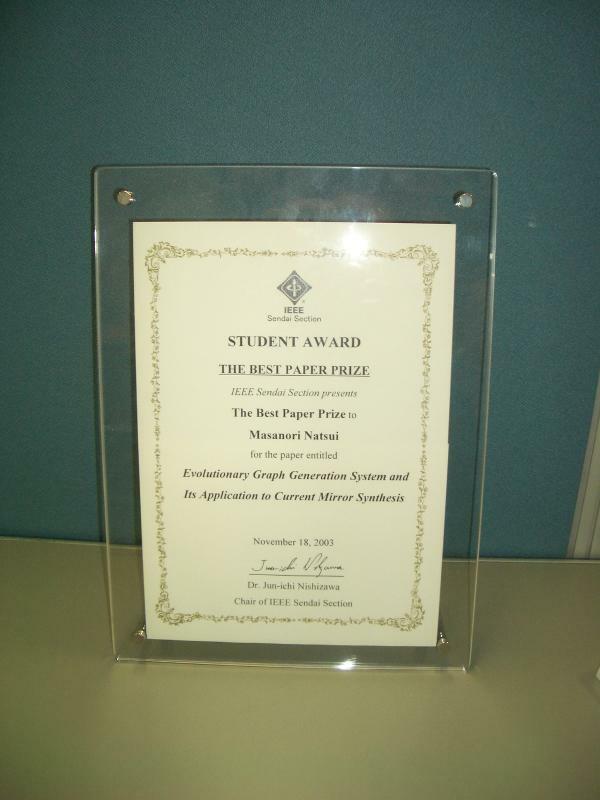 Symp. 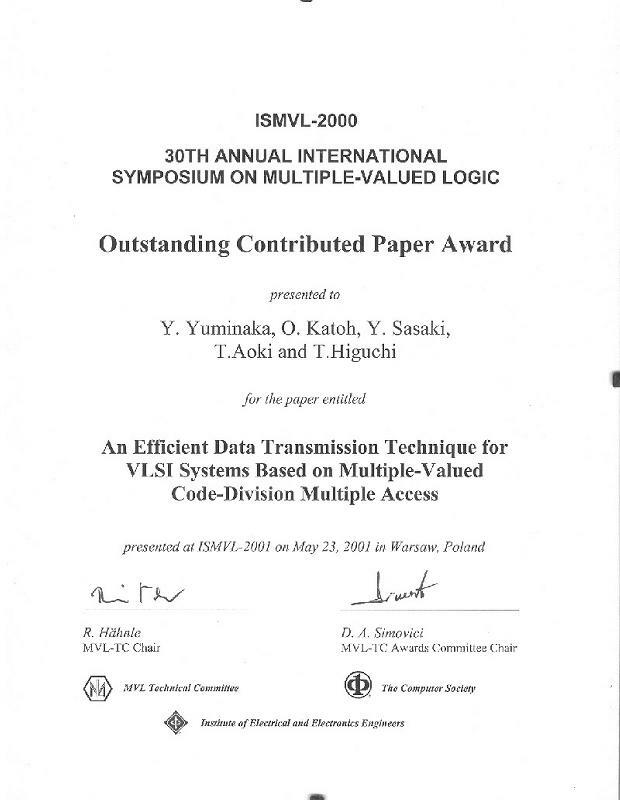 on Multiple - Valued Logic, pp. 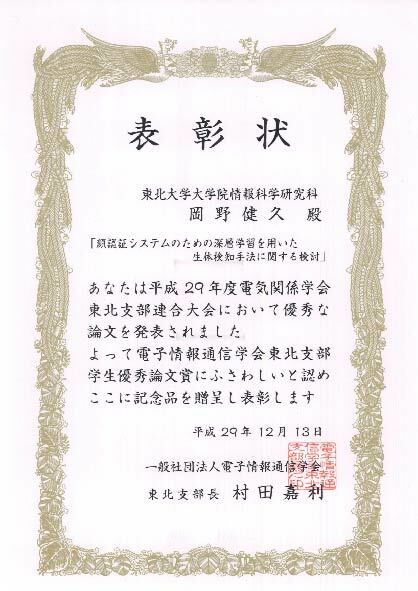 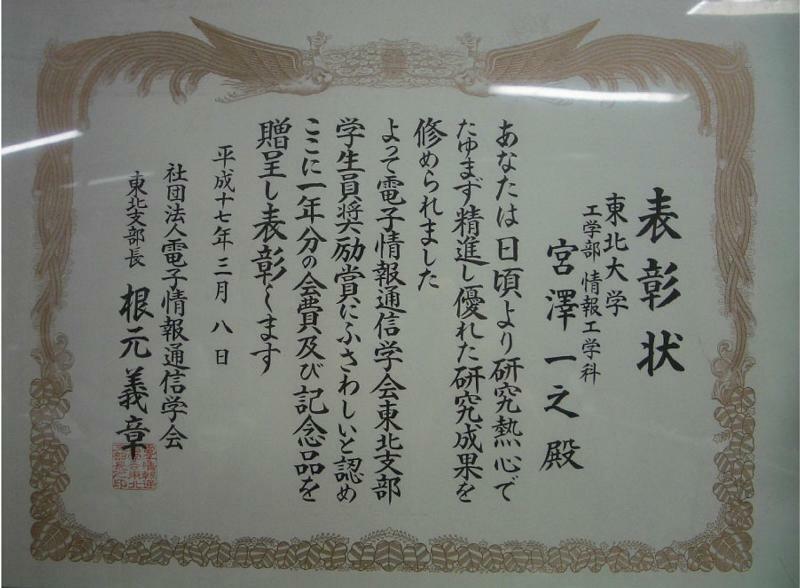 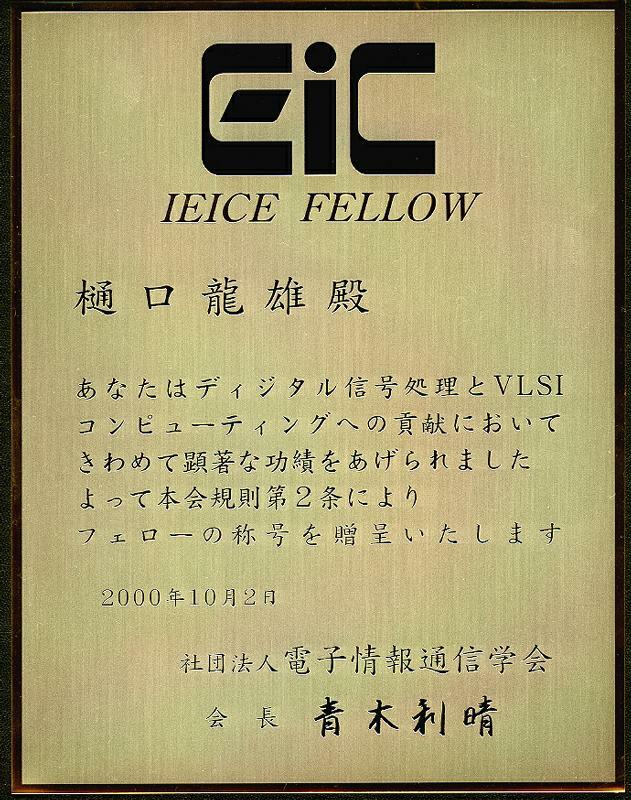 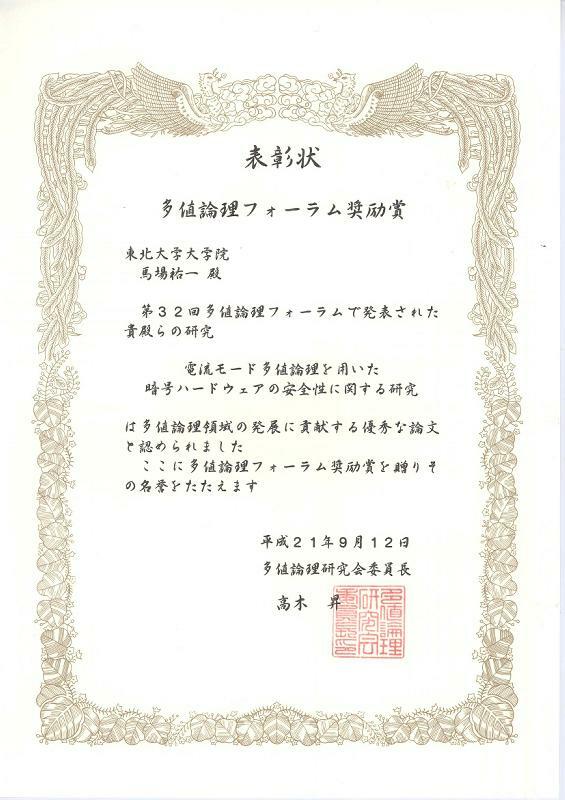 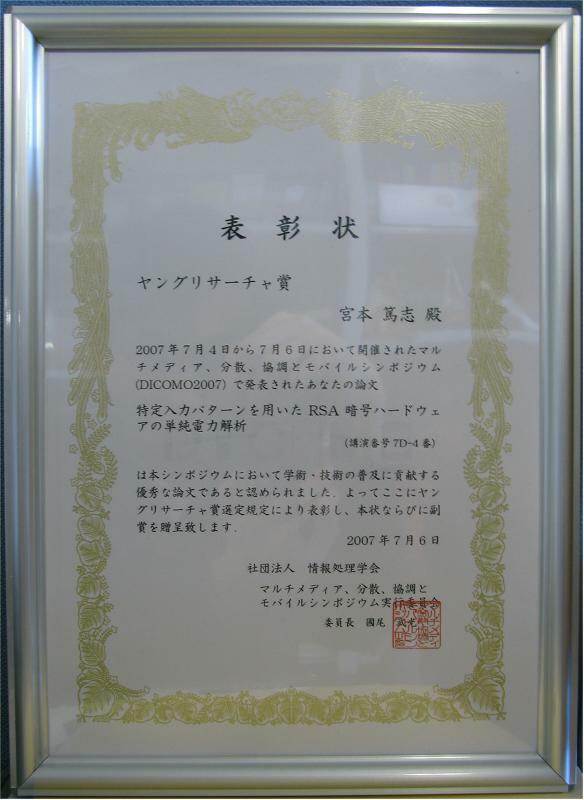 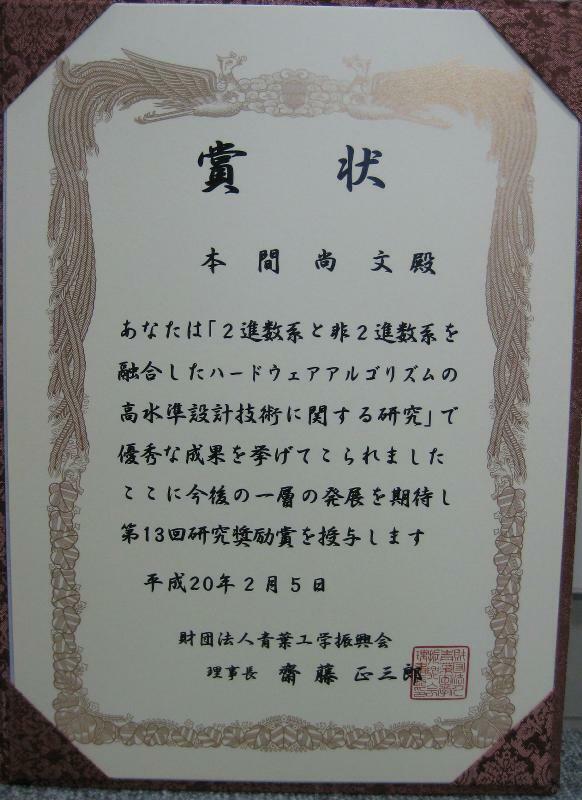 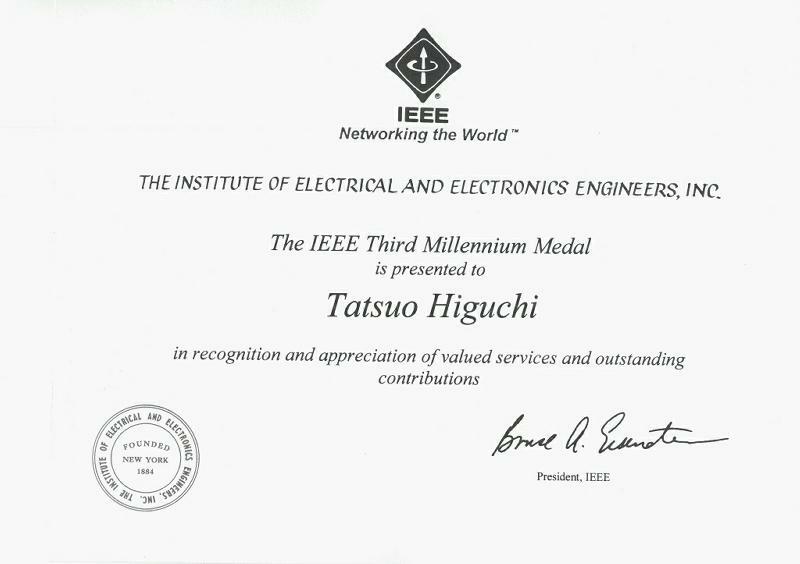 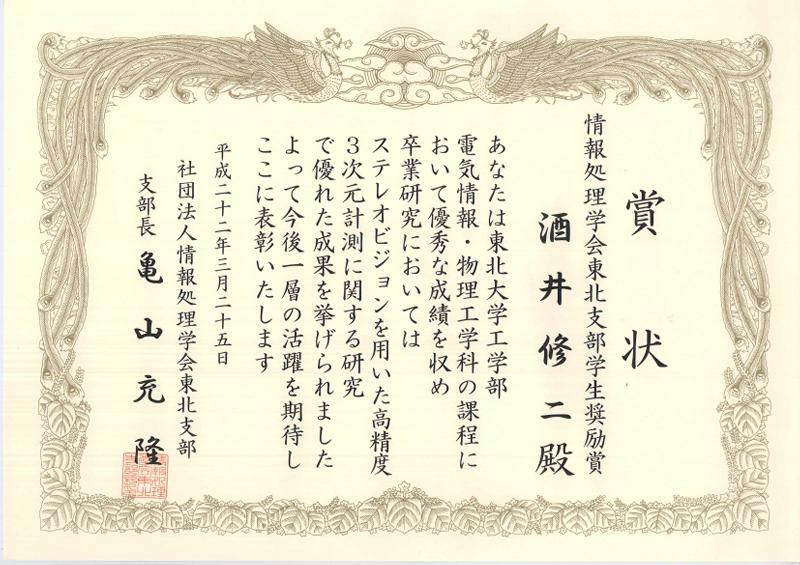 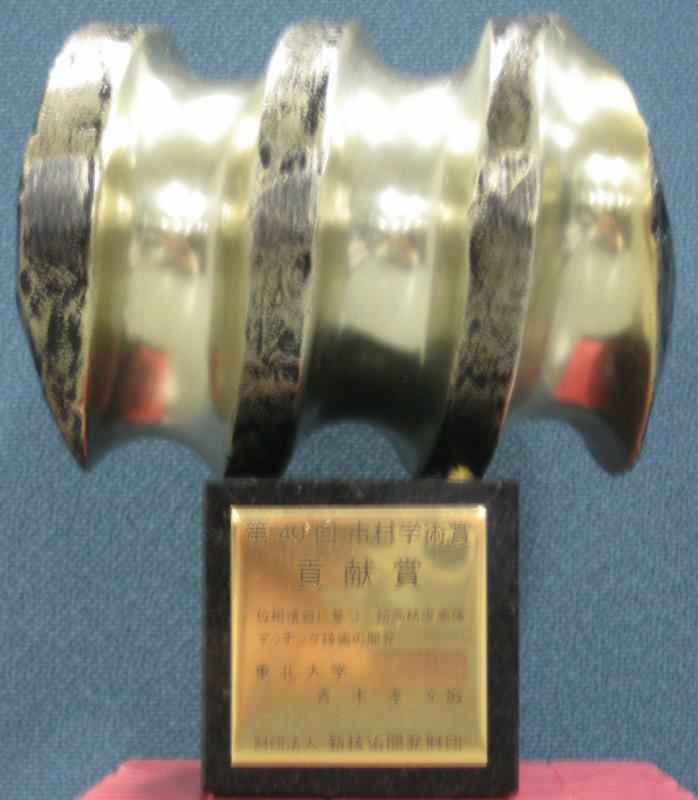 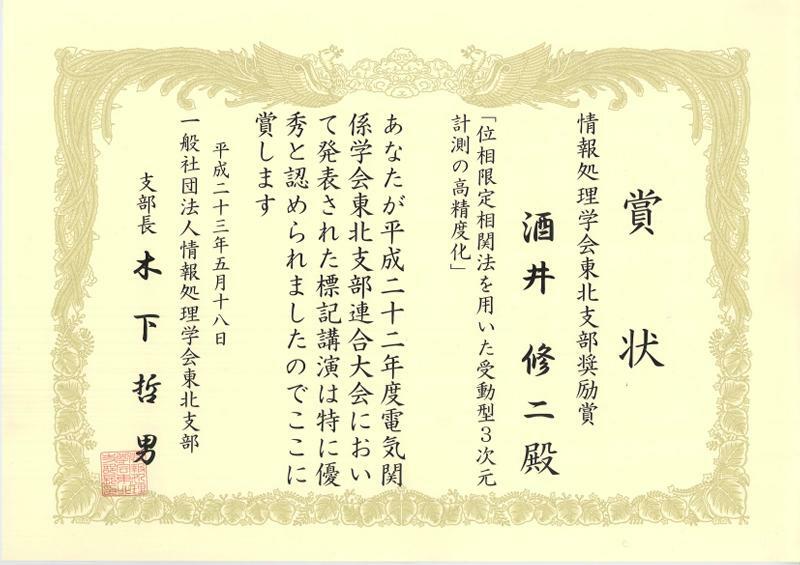 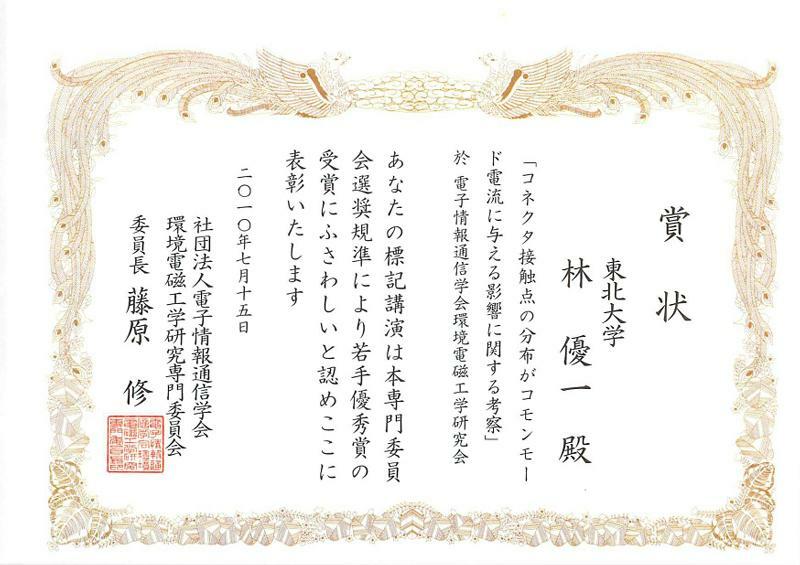 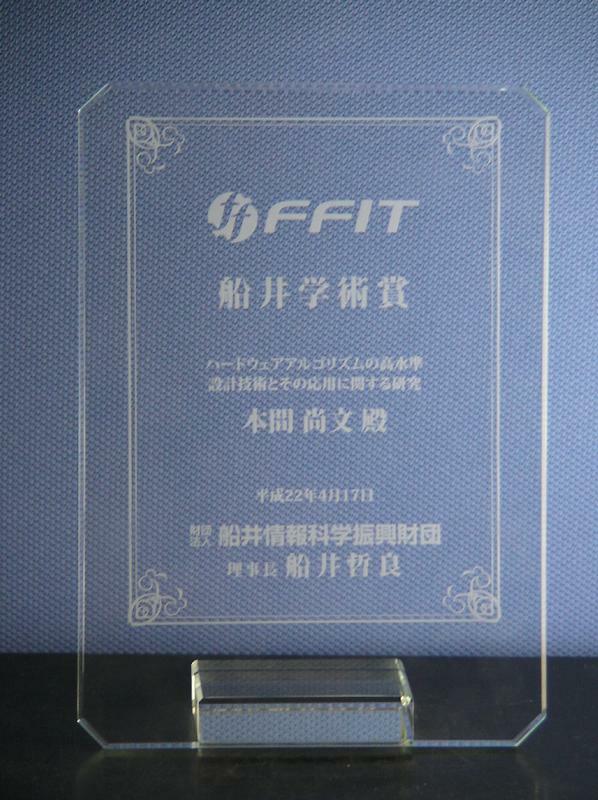 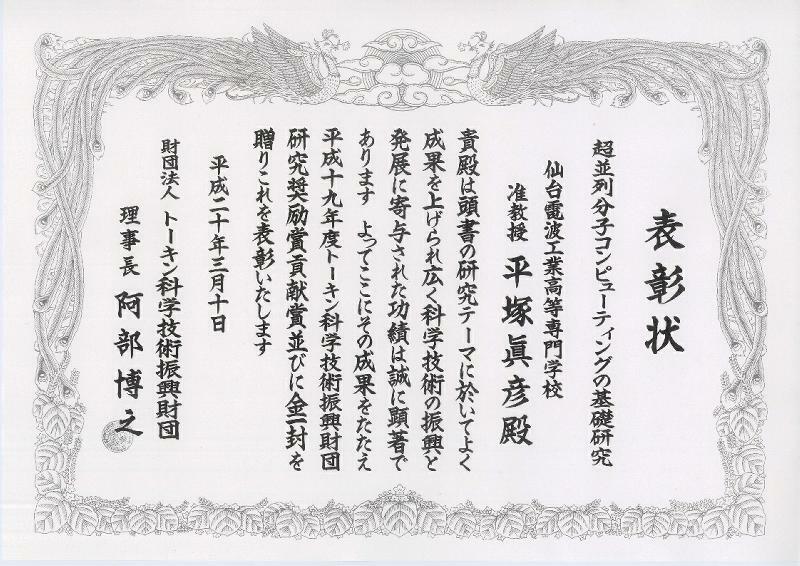 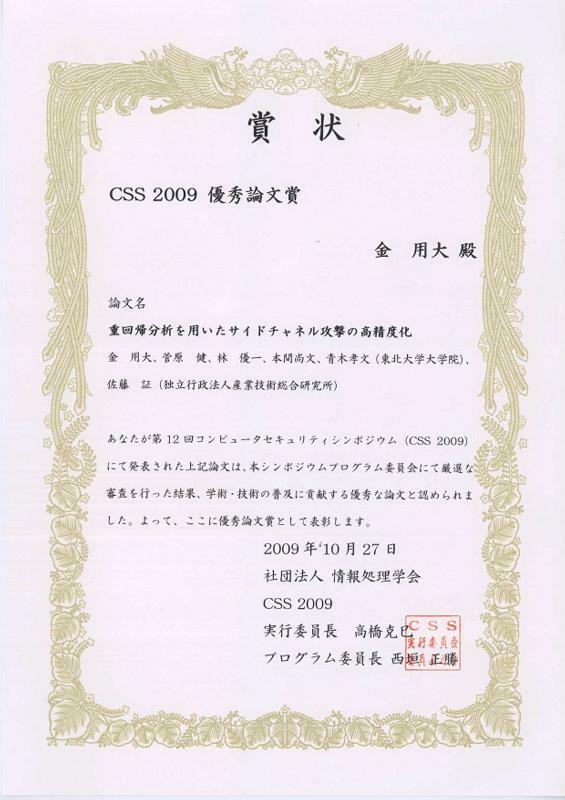 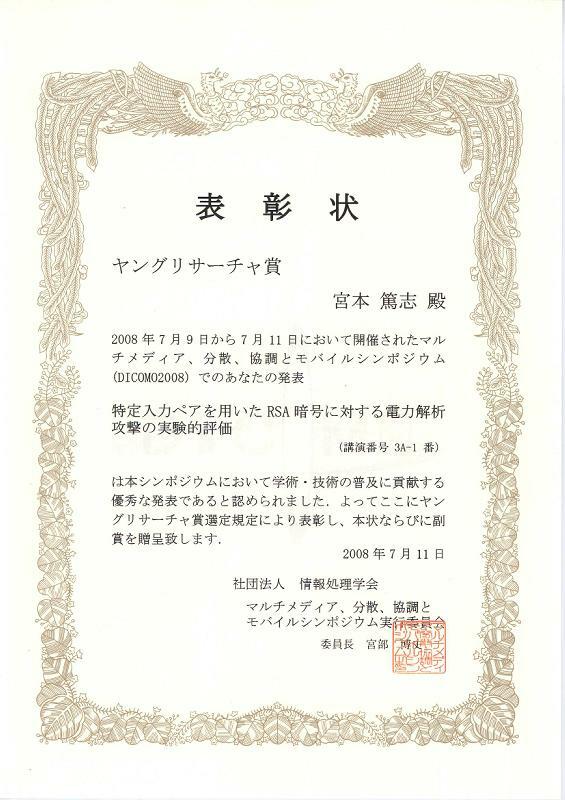 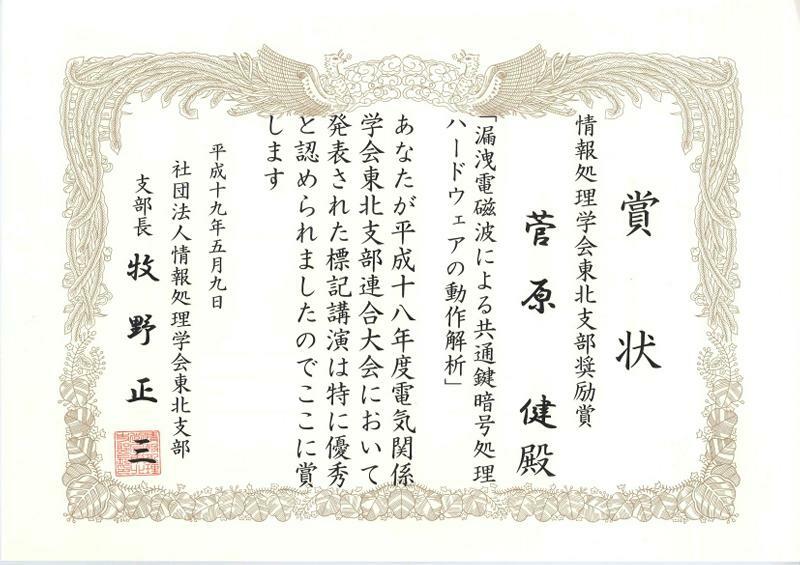 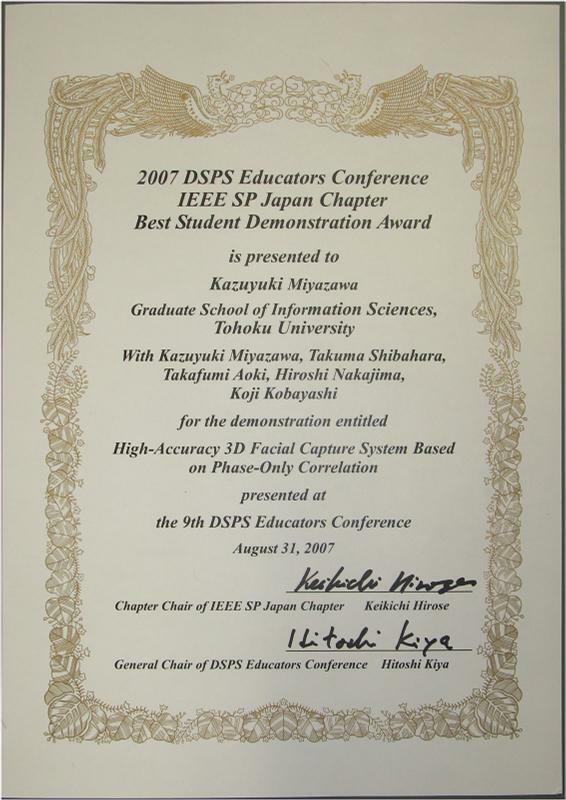 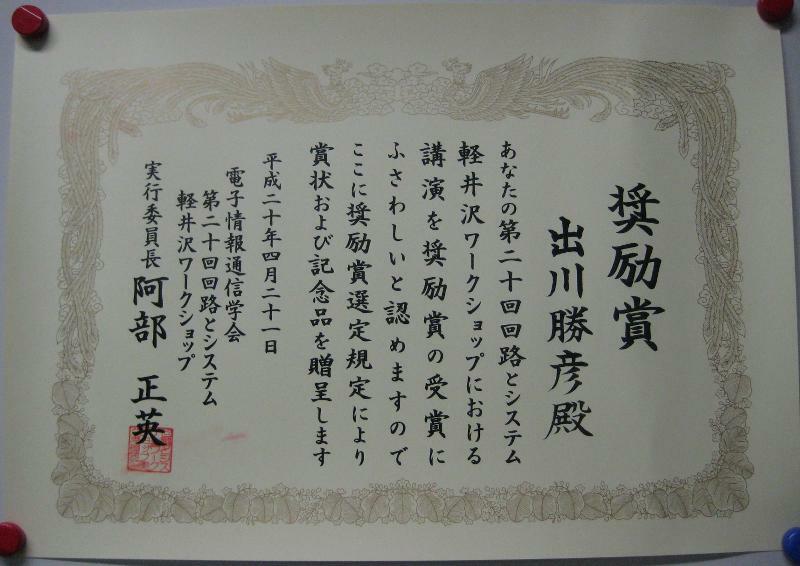 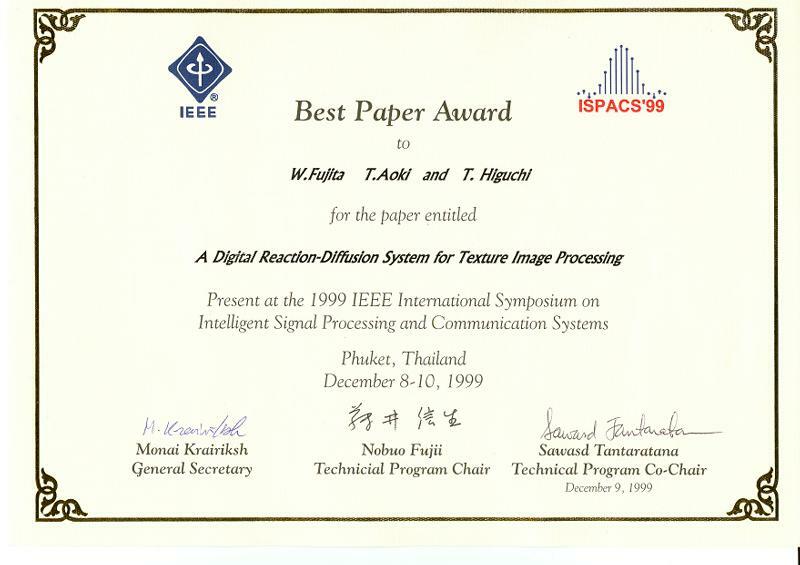 200 - 207, Portland (1999) "賞状"
The IEEE Third Millenium Medal受賞 (T. Higuchi)  In recognition and appreciation of valued services and outstanding contributions "賞状" "副賞"
Best Paper Award  W. Fujita, T. Aoki, and T. Higuchi, "A Digital Reaction-Diffusion System for Texture Image Processing," 1999 IEEE International Symposium on Intelligent Signal Processing and Communication Systems, pp. 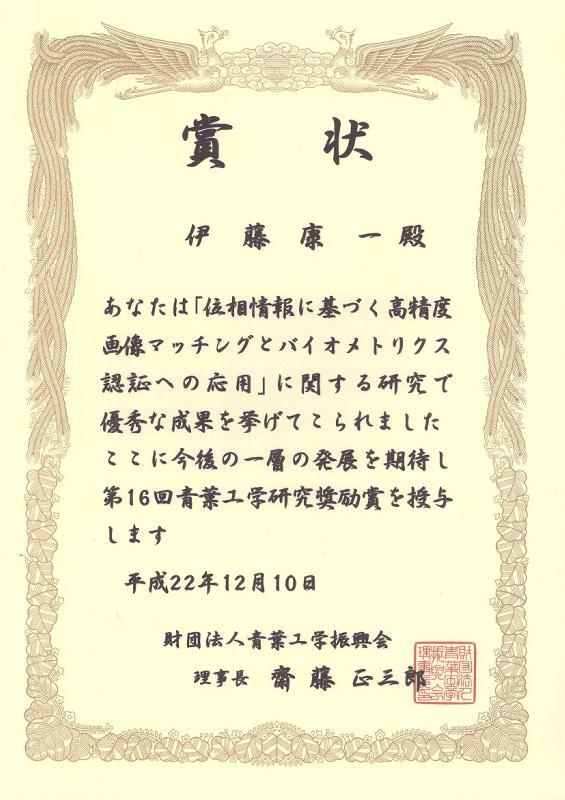 113--116, December 1999. 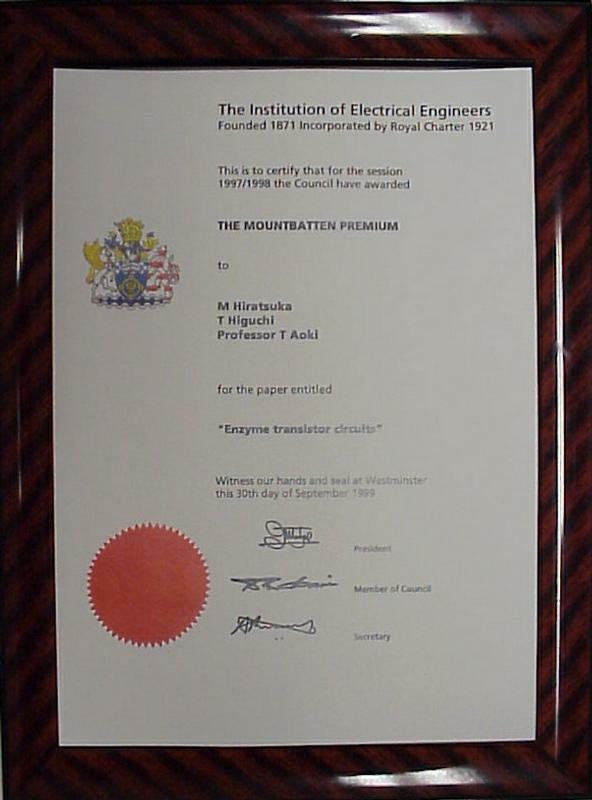 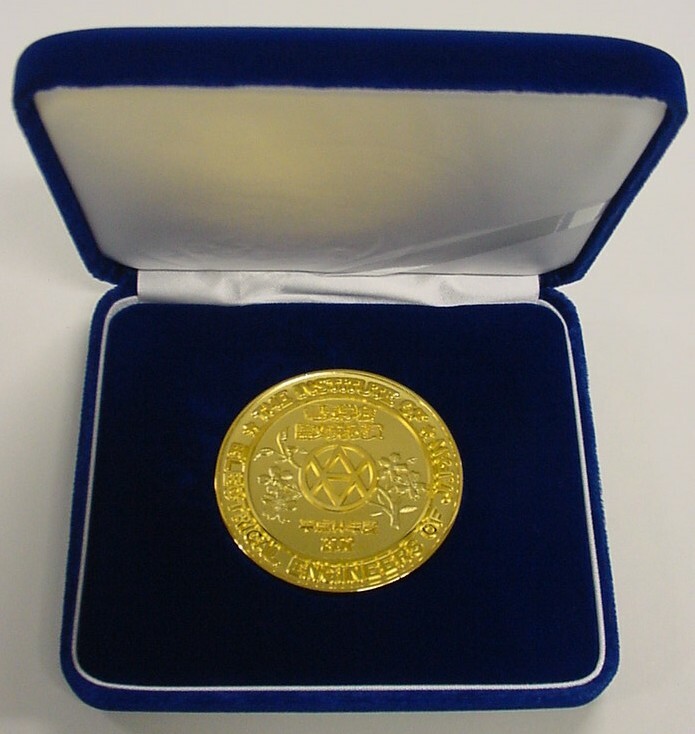 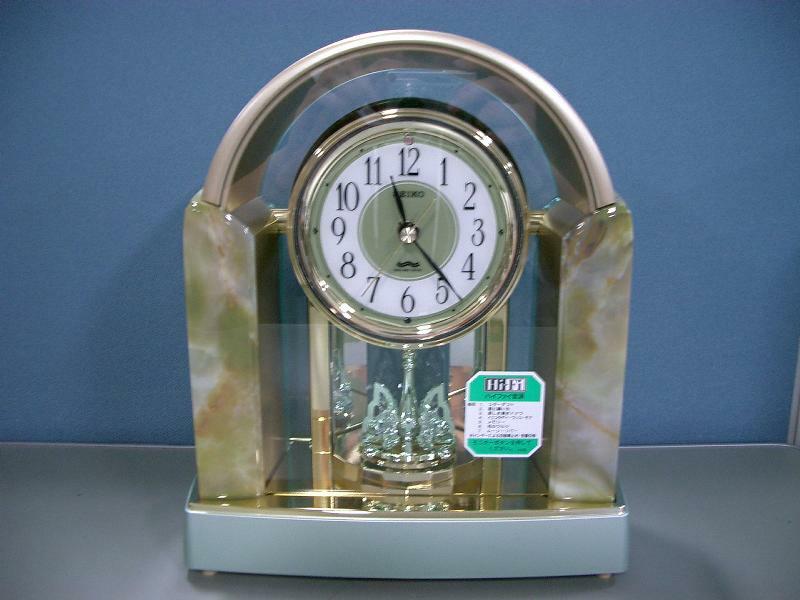 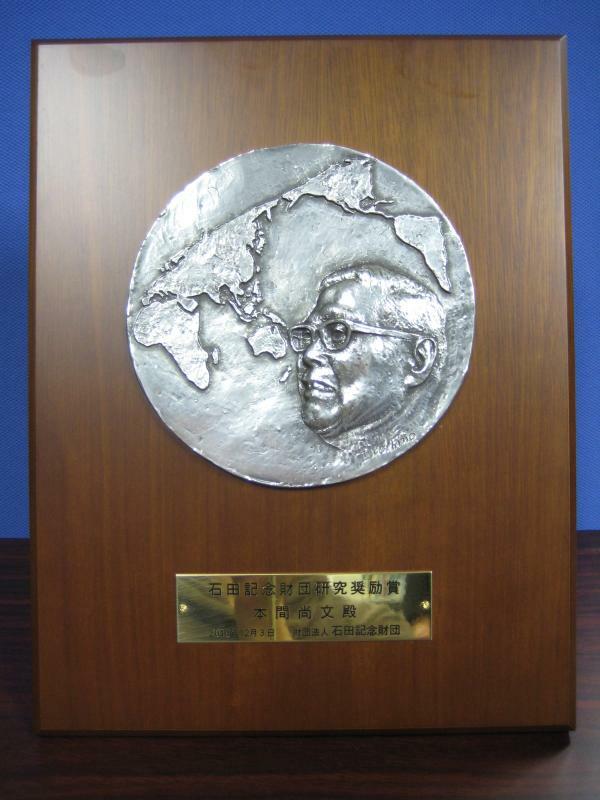 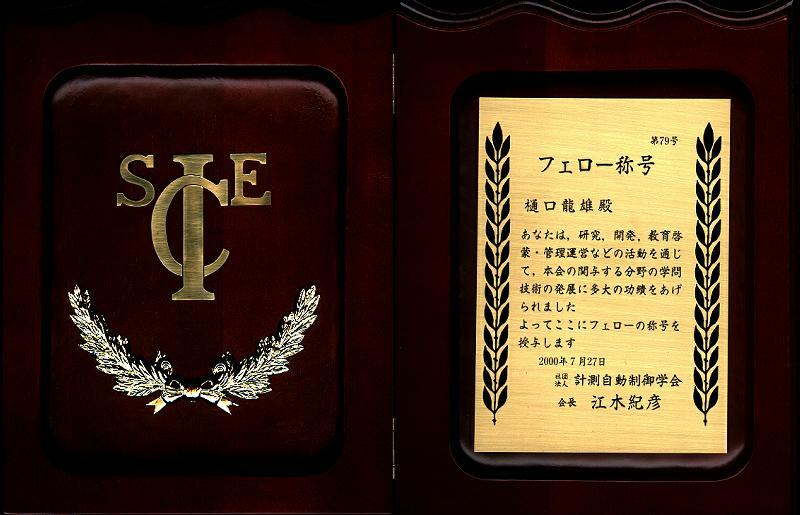 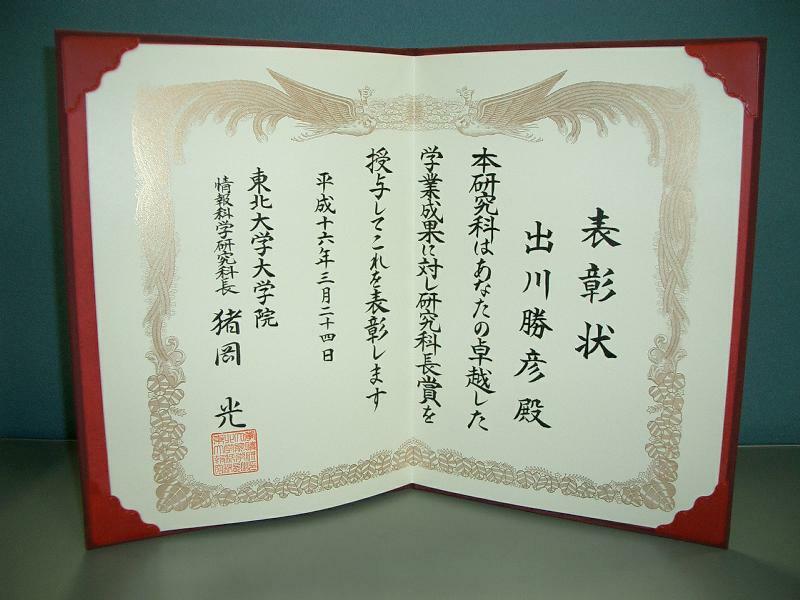 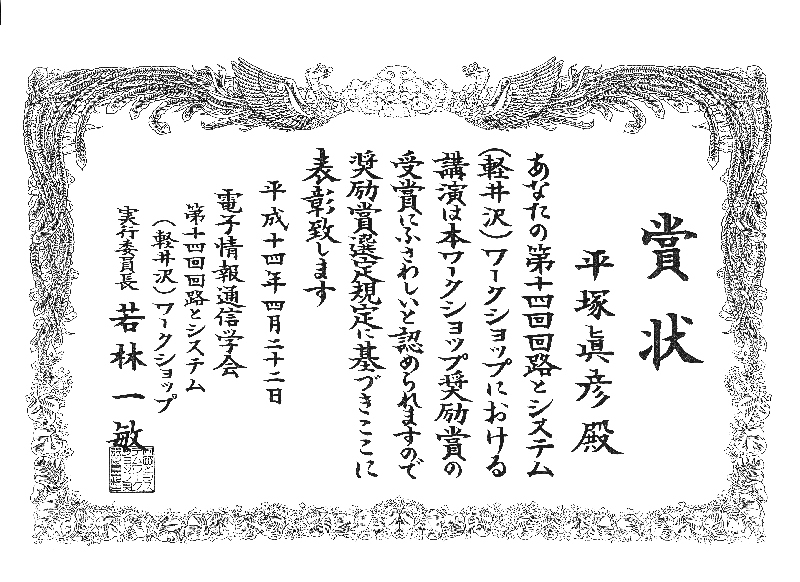 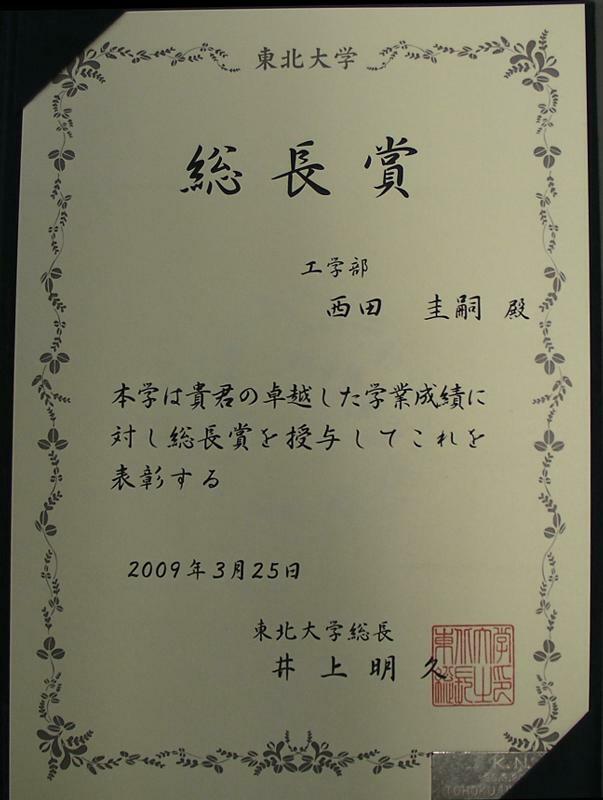 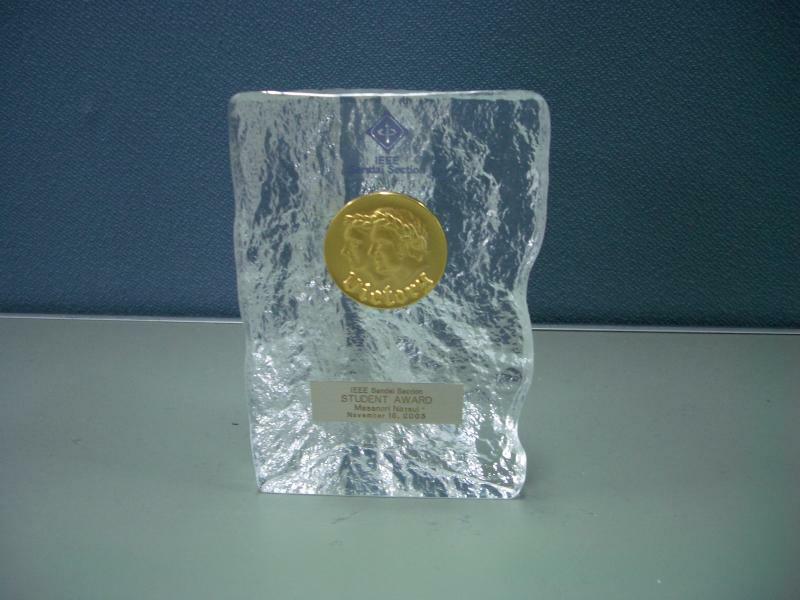 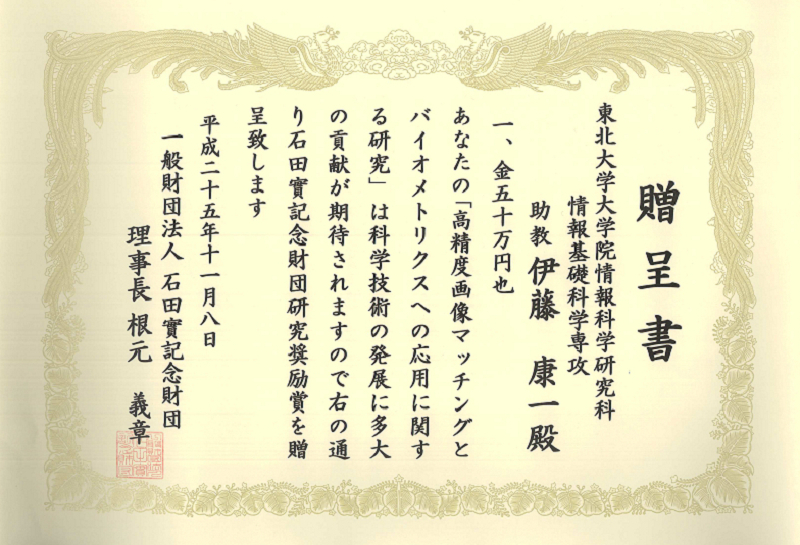 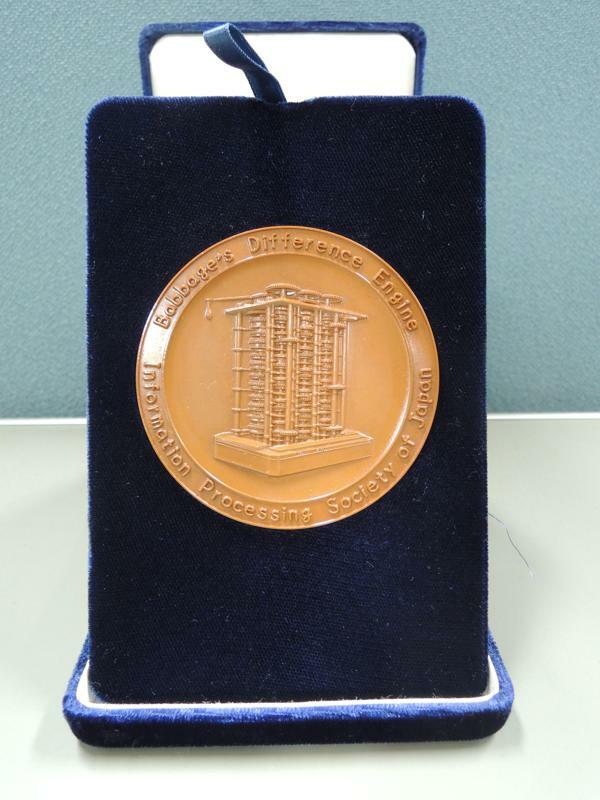 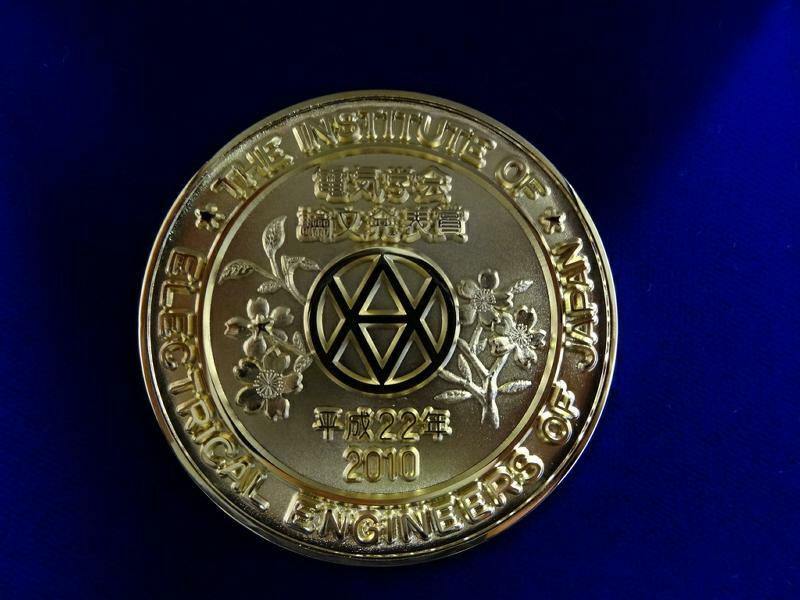 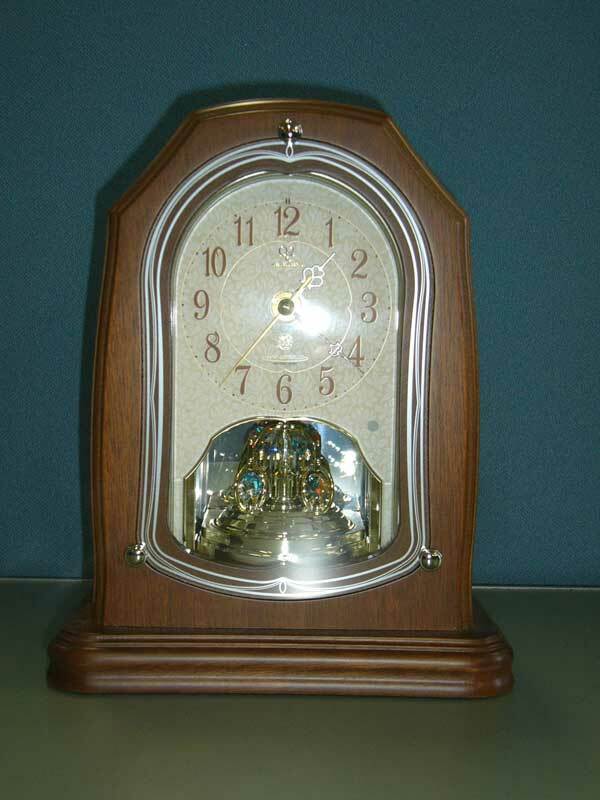 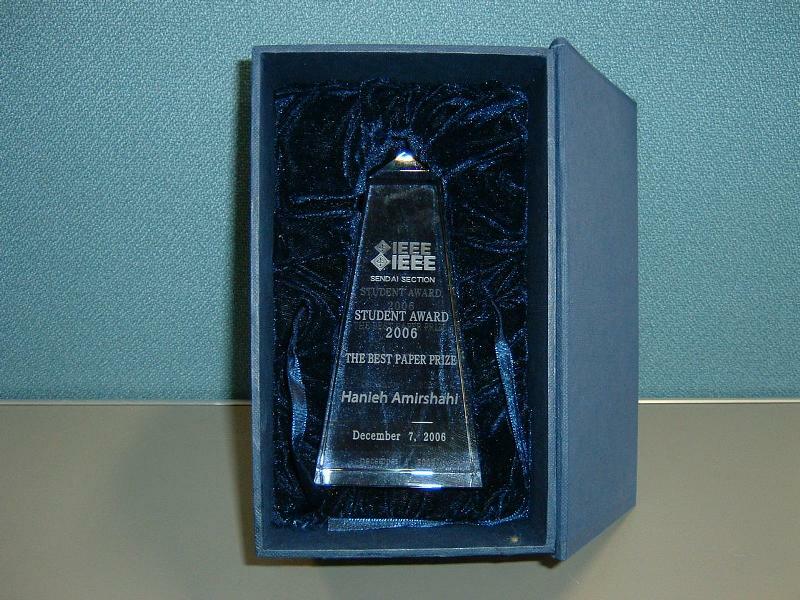 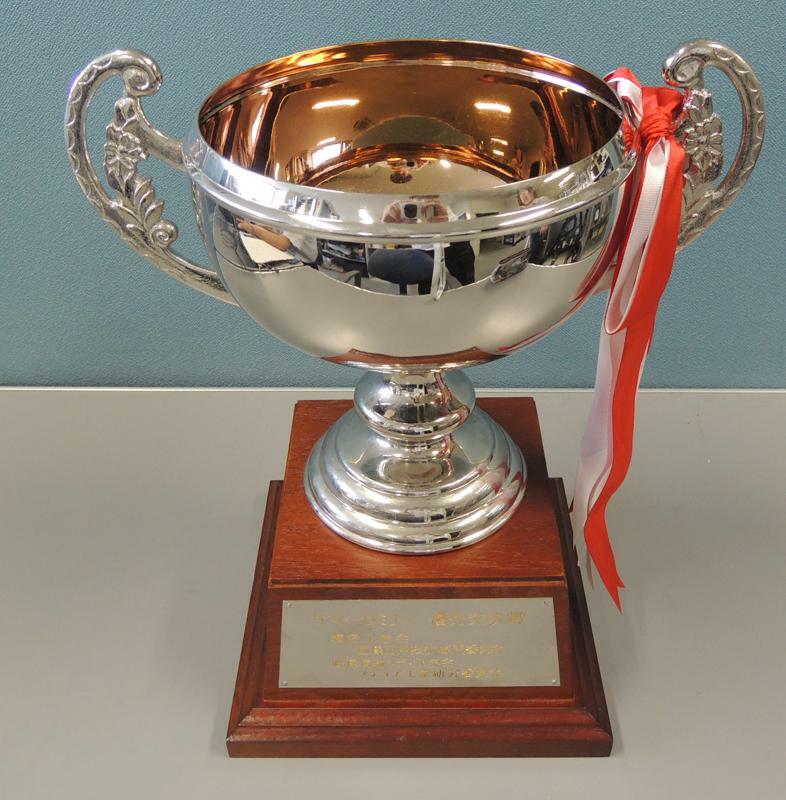 "賞状"
The IEE Mountbatten Premium Award  （IEE（英国電気学会）Mountbatten賞） T. Aoki, M. Hiratsuka and T. Higuchi,"Enzyme transistor circuits," IEE Proceedings - Circuits, Devices and Systems, Vol. 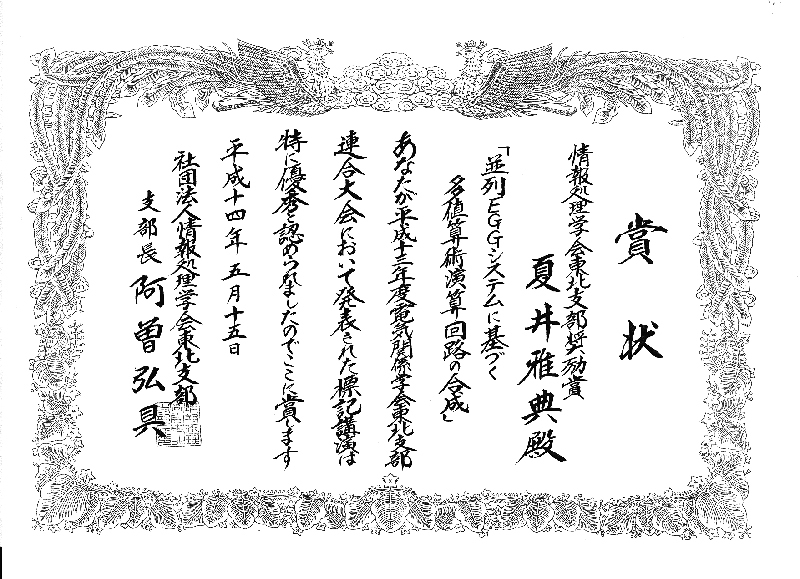 145, No. 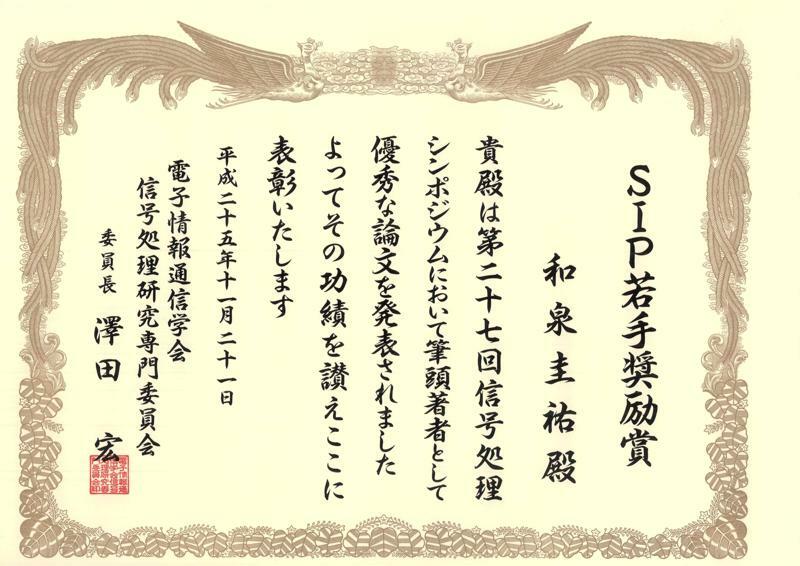 4, pp. 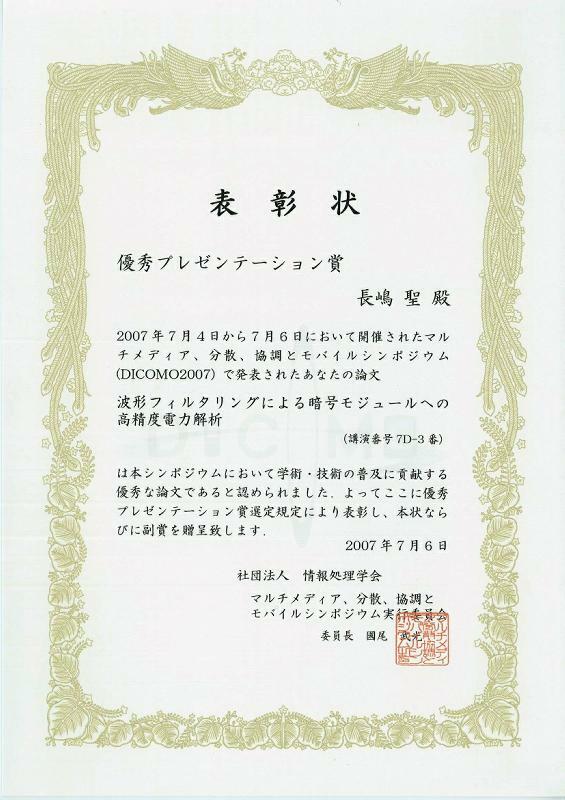 264--270, August 1998. 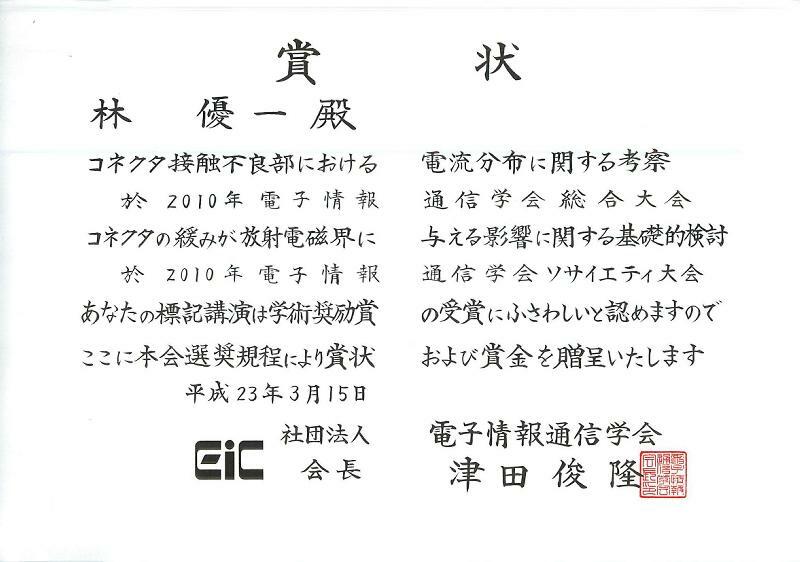 "賞状"
電子情報通信学会論文賞  青木、平塚、樋口：酵素トランジスタ回路の解析と設計、電子情報通信学会論文誌 A、Vol. 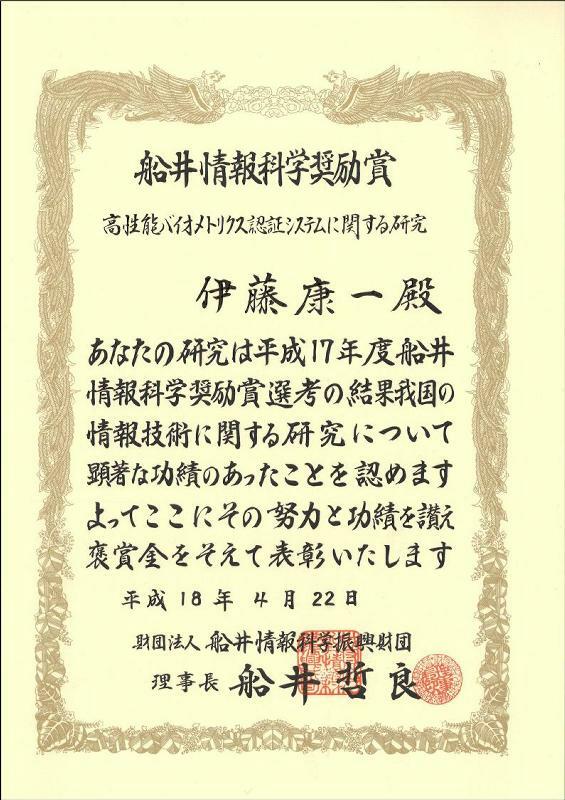 J - 79A, No. 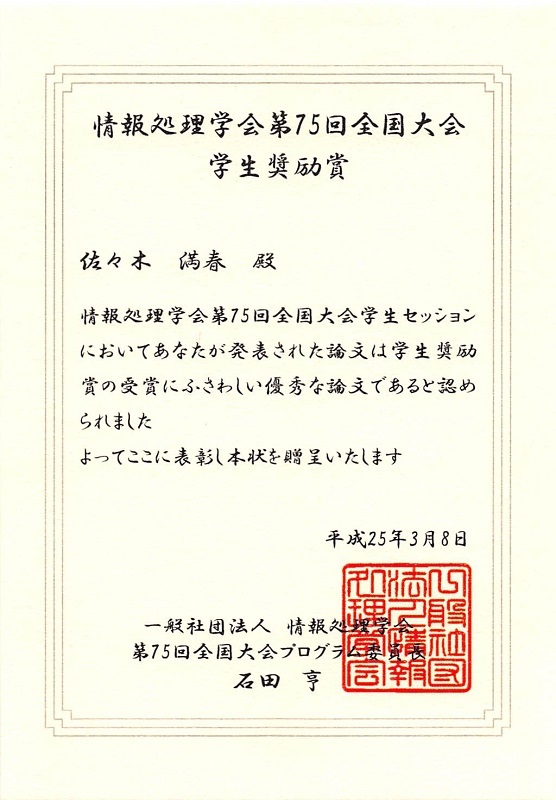 5, pp. 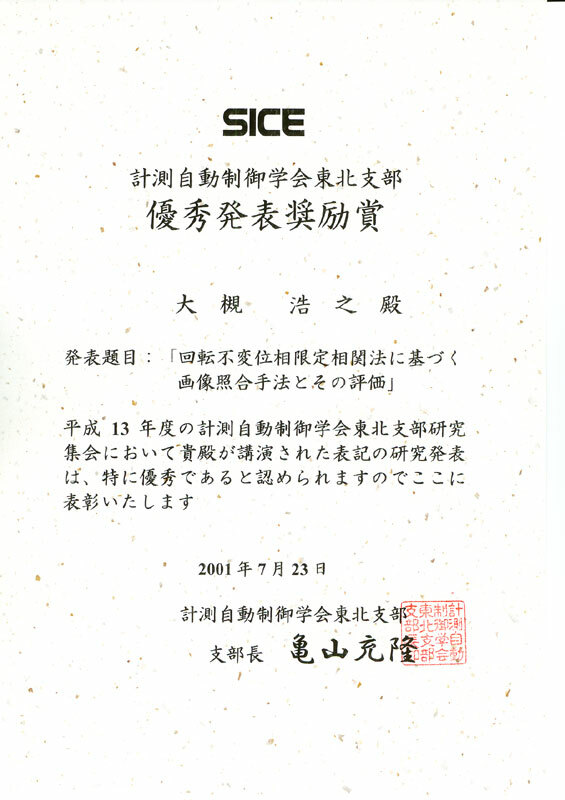 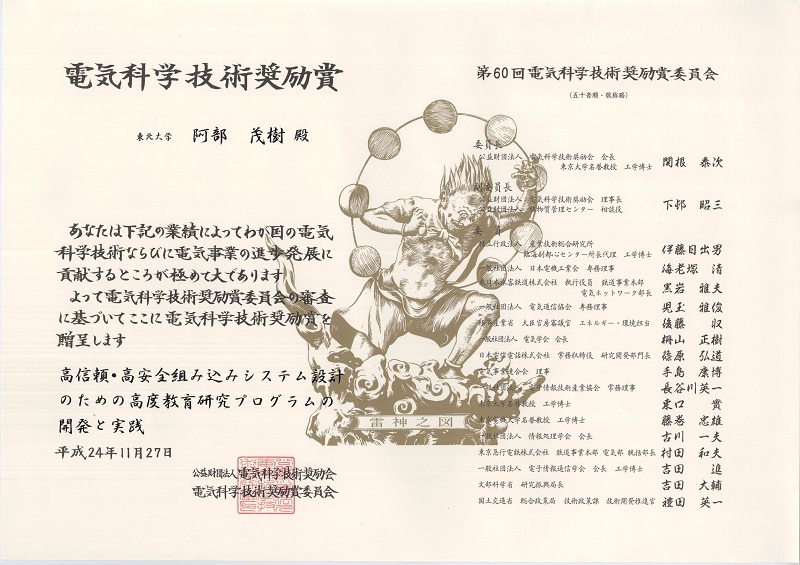 1073 - 1081 (1996) "賞状"
電子情報通信学会猪瀬賞（年間最優秀論文賞）  同 上 論 文 "賞状"
Kenneth C.Smith Early Career Award in Microelectronics  上野 "賞状"
情報処理学会 第77回全国大会 学生奨励賞  草薙 "賞状"
情報処理学会 第77回全国大会 学生奨励賞  近藤 "賞状"
情報処理学会 第77回全国大会 学生奨励賞  丸木 "賞状"
情報処理学会 第76回全国大会 大会奨励賞  山尾 "賞状" "副賞"
東北大学工学部 工学部長賞  梨本 "賞状" "副賞"
情報処理学会 第76回全国大会 学生奨励賞  山尾 "賞状"
情報処理学会 第75回全国大会 大会奨励賞  酒井 "賞状" "副賞"
RIEC Award 東北大学研究者賞  本間 "賞状" "副賞"
サマーセミナー2011 優秀発表賞  石井 "賞状" "副賞"
IEEE Student Award The Best Paper Prize  馬場 "賞状"
IEEE Student Award The Best Paper Prize  服部 "賞状" "副賞"
2007 DSPS Educators Conference IEEE SP Japan Chapter Best Student Demonstration Award  宮澤 "賞状" "副賞"
IEEE Student Award The Best Paper Prize  アルベット "賞状" "副賞"
DICOMO2007 ヤングリサーチャ賞  宮本 [特定入力パターンを用いたRSA暗号ハードウェアの単純電力解析] "賞状"
IEEE Student Award The Best Paper Prize  ハニア [A 3D Measurement System Using Phase-Based Image Matching] "賞状" "副賞"
安藤博記念学術奨励賞  本間 [二進数系と非二進数系を統合したハードウェアアルゴリズムの高水準設計技術に関する研究] "賞状" "副賞"
IEEE Student Award The Best Paper Prize  夏井 "賞状" "副賞"
東北大学工学部 工学部長賞  早坂 "賞状" "副賞"
東北大学大学院情報科学研究科 研究科長賞  出川 "賞状" "副賞"
情報処理学会東北支部奨励賞  夏井 ［夏井，青木，樋口：並列EGGシステムに基づく多値算術演算回路の合成，2001年電気関係学会東北支部連合大会，2F17，pp. 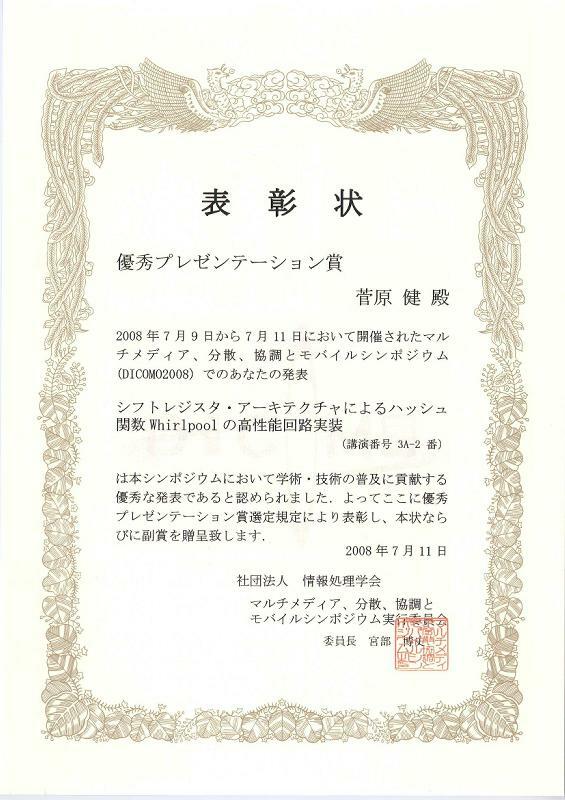 204 (2001)］ "賞状"
第14回 回路とシステム（軽井沢）ワークショップ奨励賞  平塚 [M. Hiratsuka, H. Morimitsu, T. Aoki, and T. Higuchi, "Active Wave Propagation in One-Dimensional Reaction-Diffusion Cellular Automata," Proc. 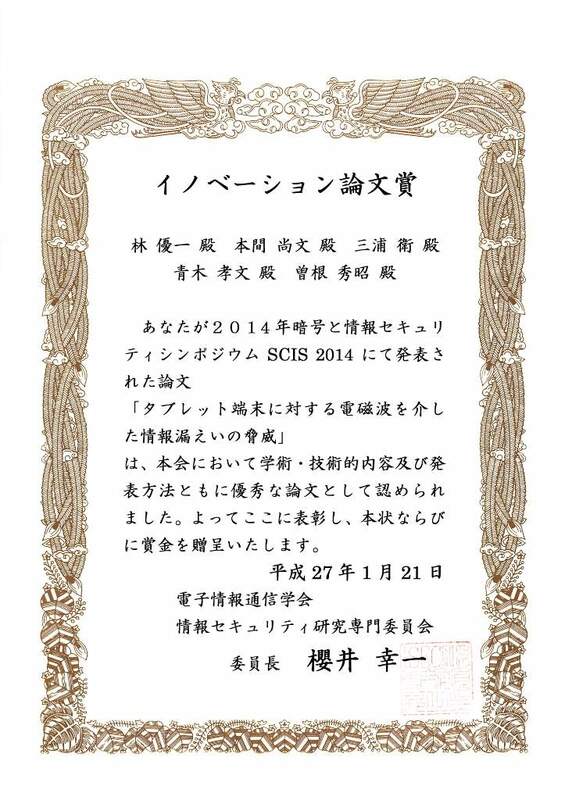 The 14th Workshop on Circuits and Systems in Karuizawa, pp. 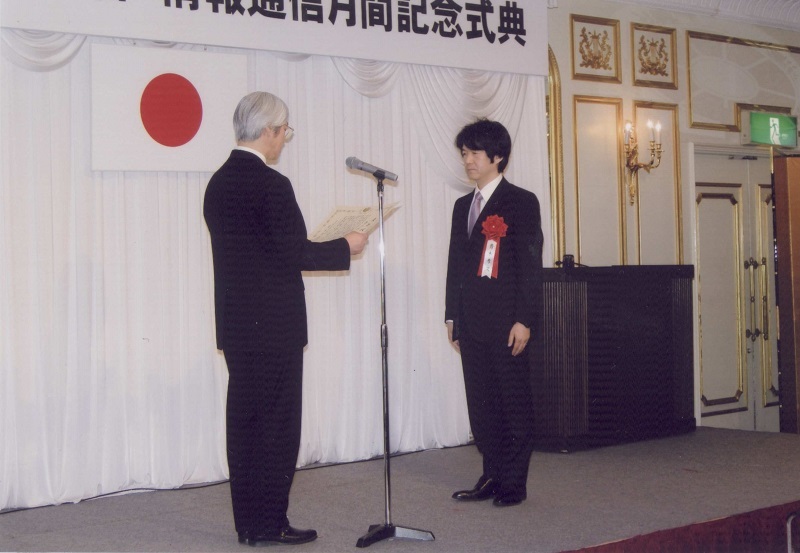 447--452, April 2001. ] 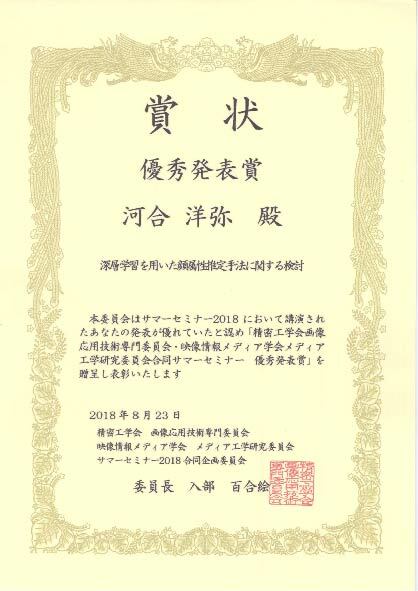 "賞状"
情報処理学会東北支部奨励賞  伊藤 ［伊藤，青木，樋口：指紋画像強調のための非線形ディジタル反応拡散システムの設計，2000年電気関係学会東北支部連合大会，2D21，pp. 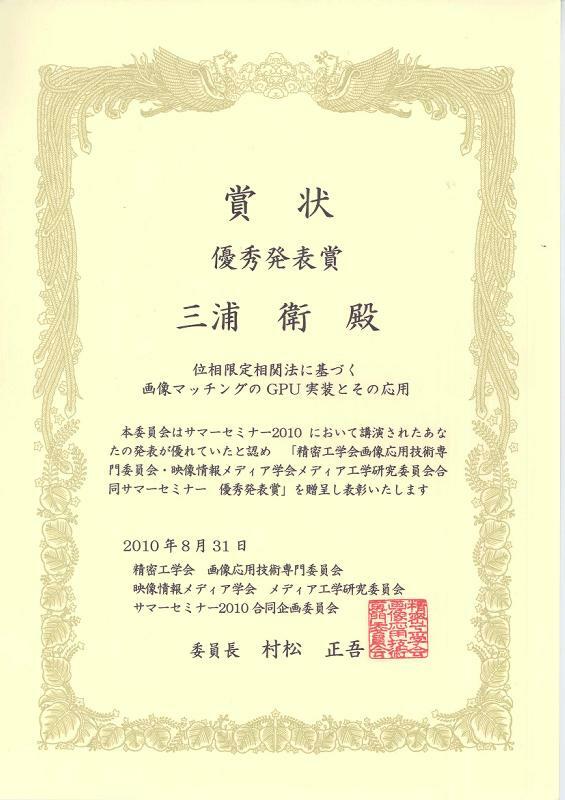 158 (2000)］ "賞状"
Copyright(C) 2010-2018 東北大学大学院情報科学研究科 青木研究室 All Rights Reserved.